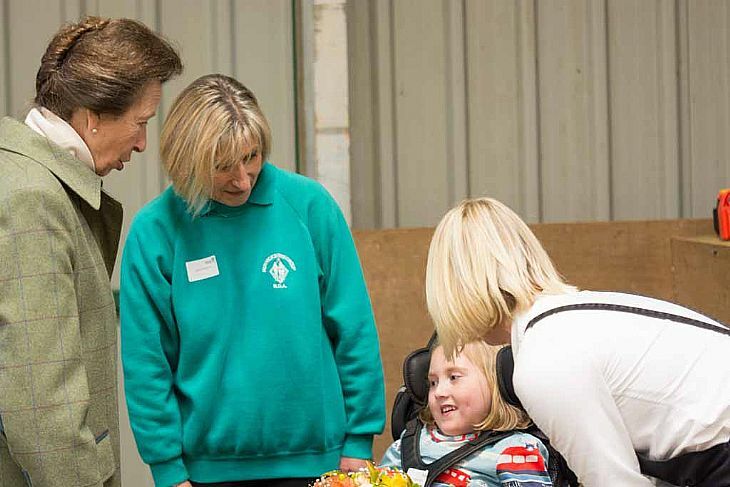 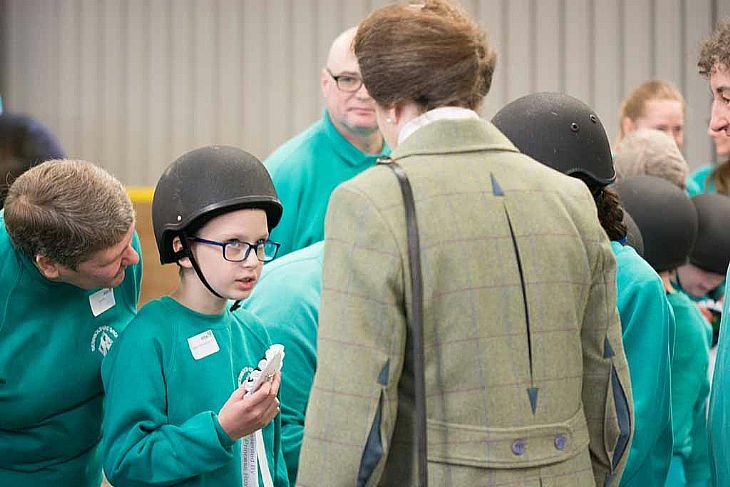 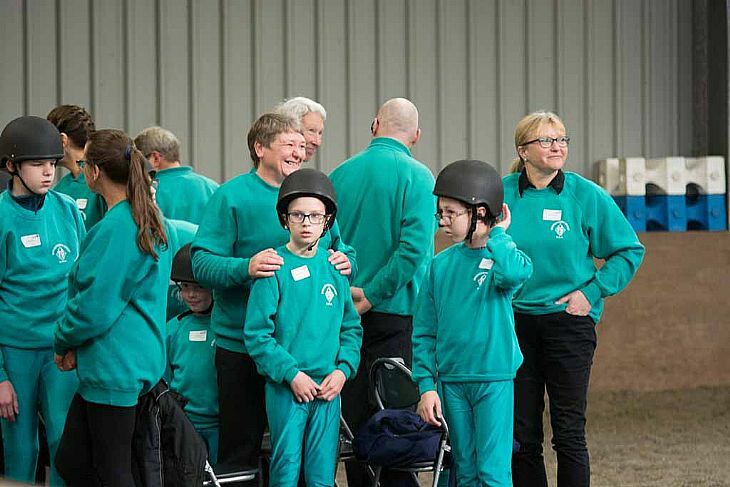 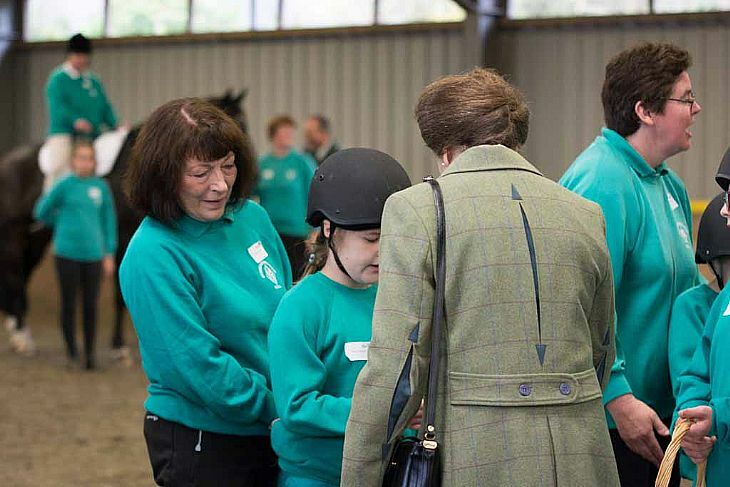 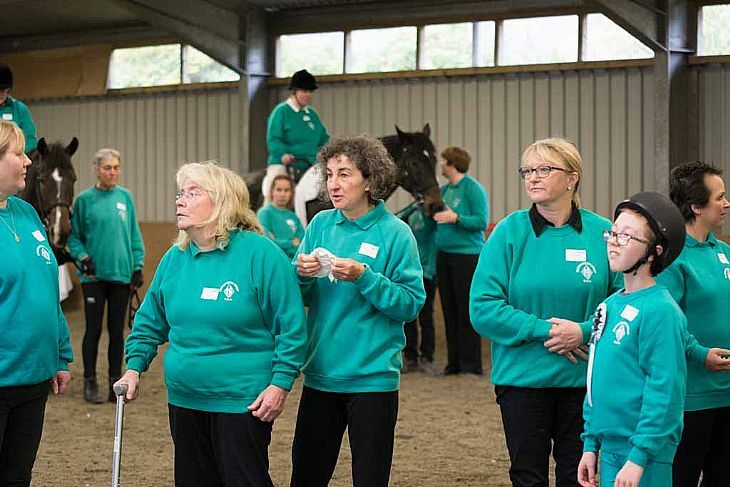 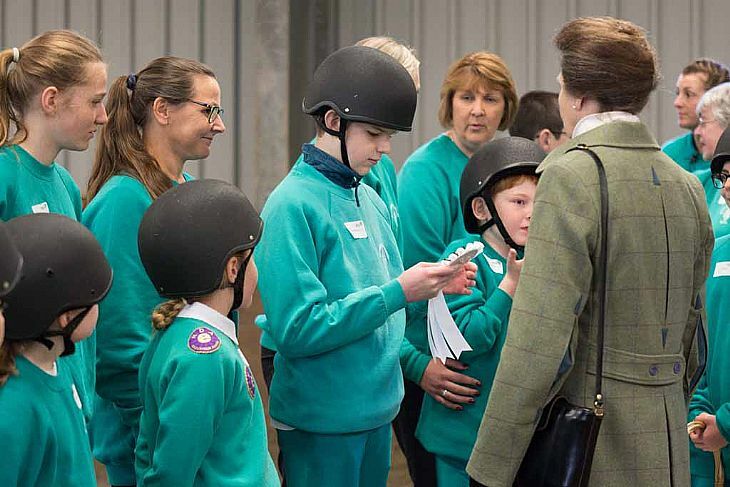 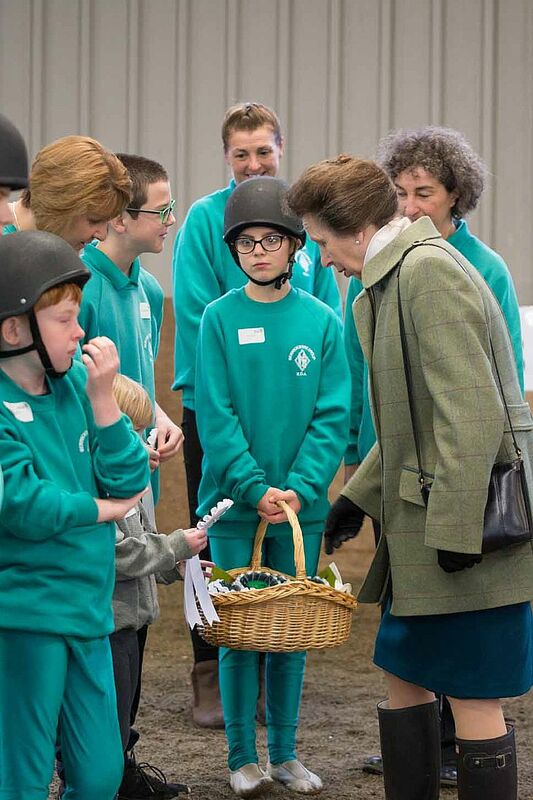 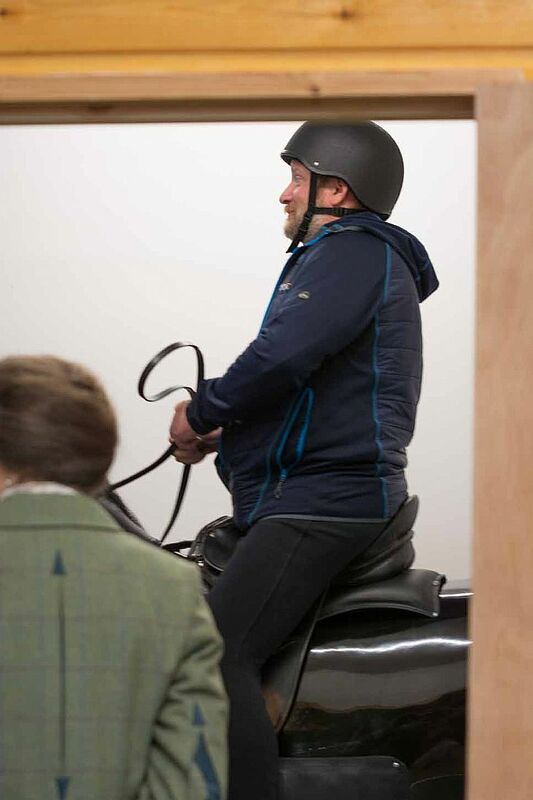 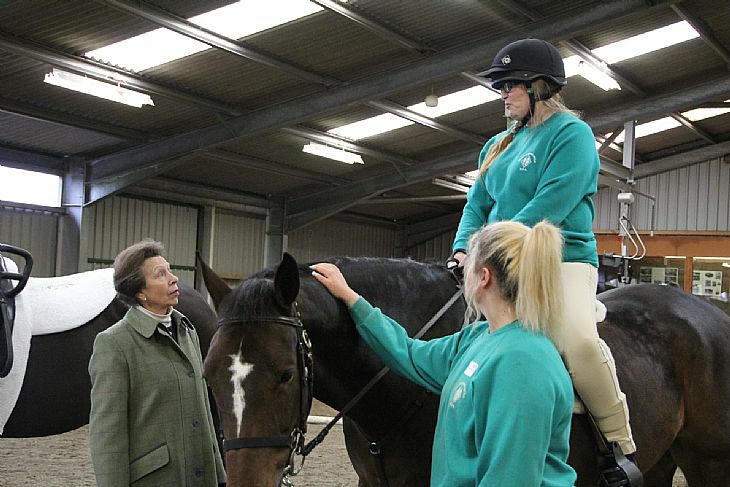 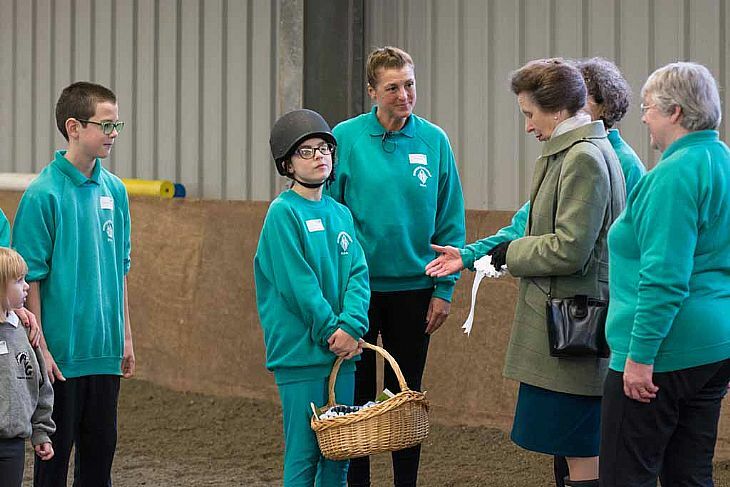 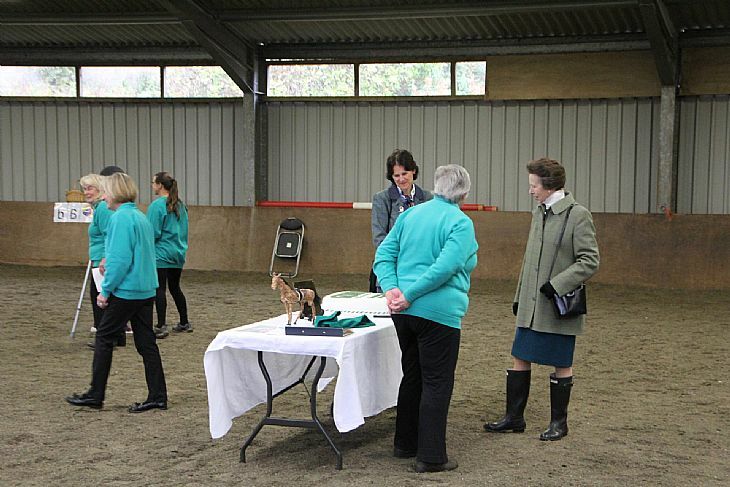 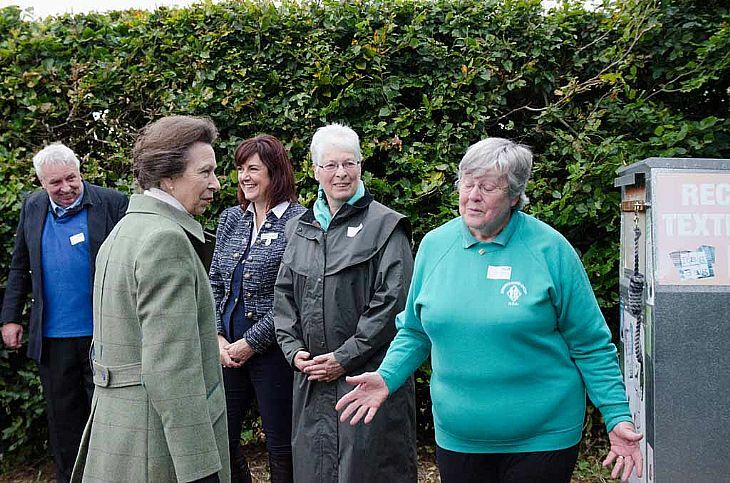 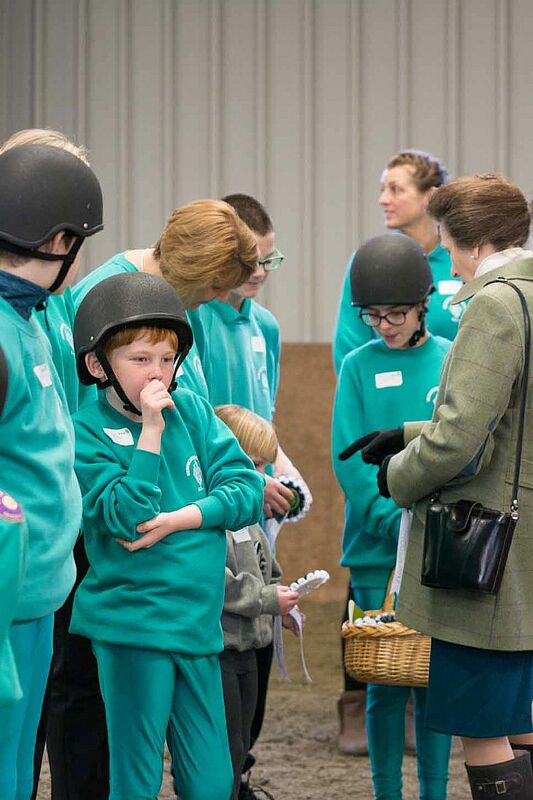 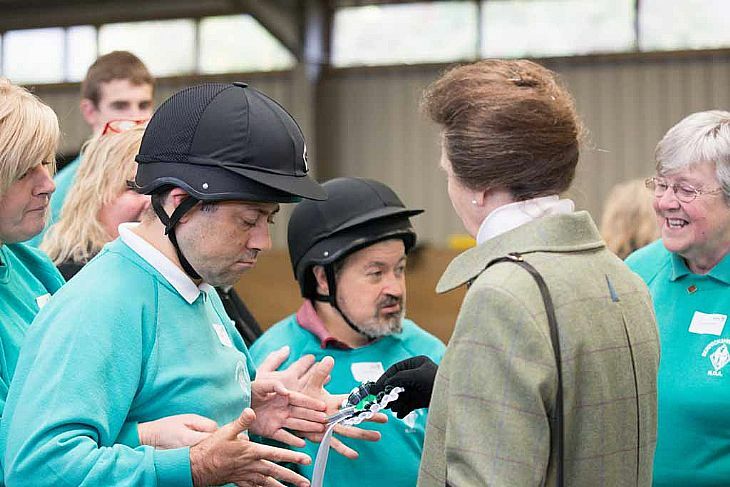 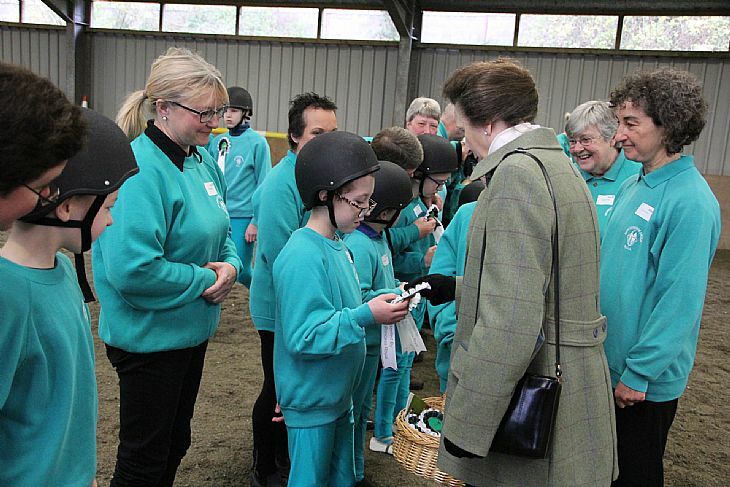 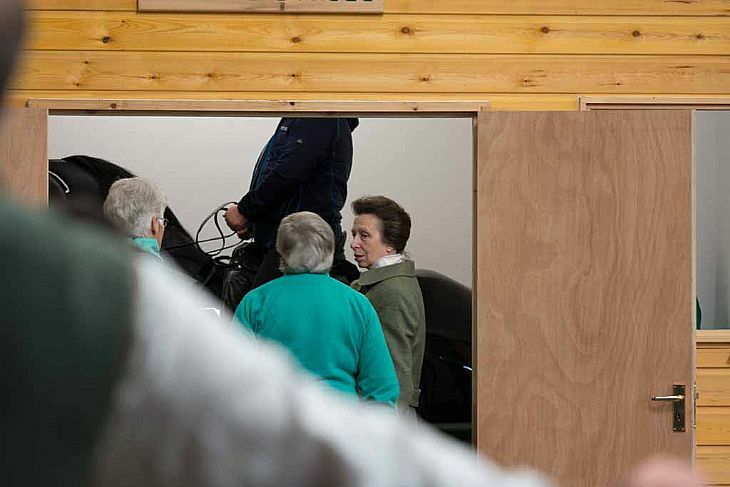 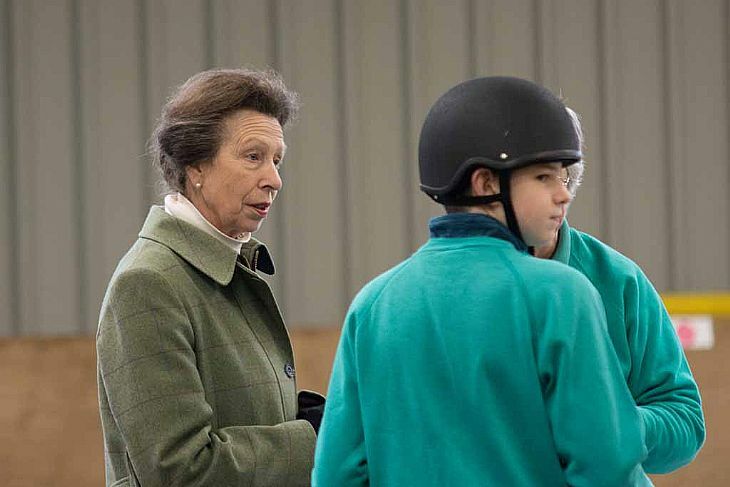 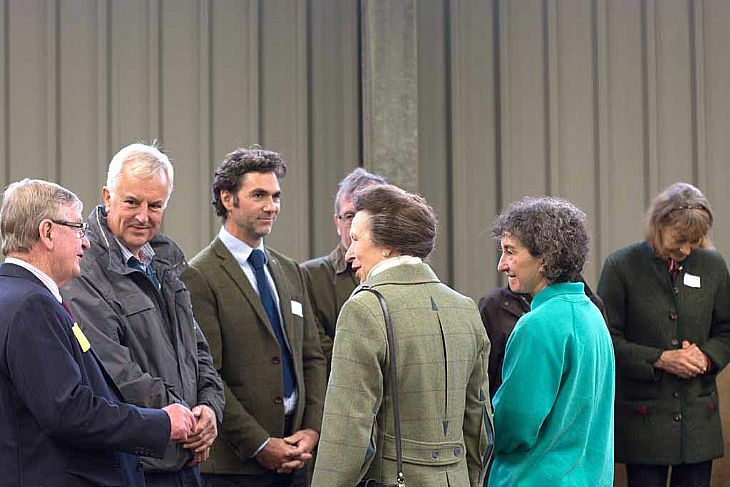 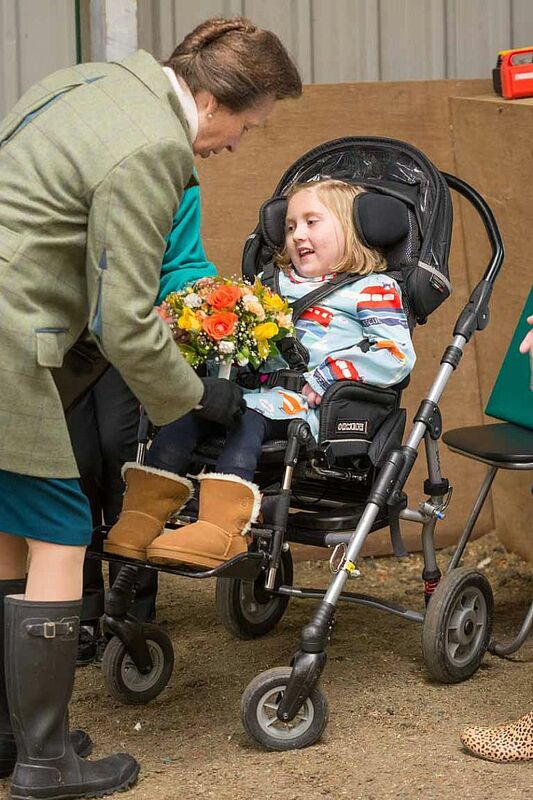 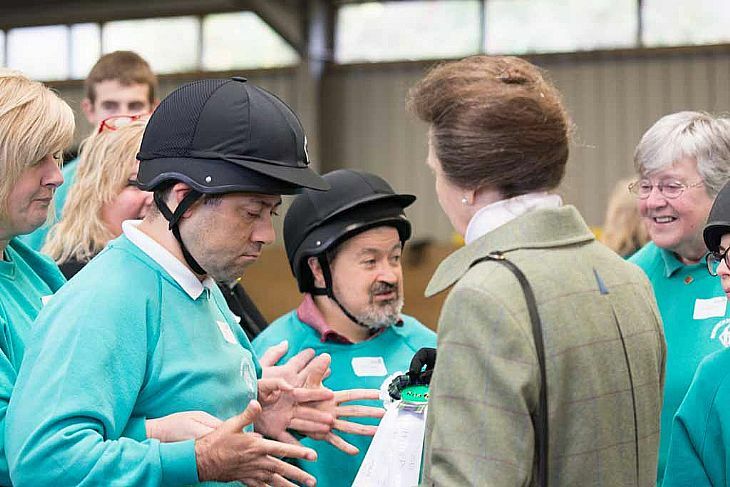 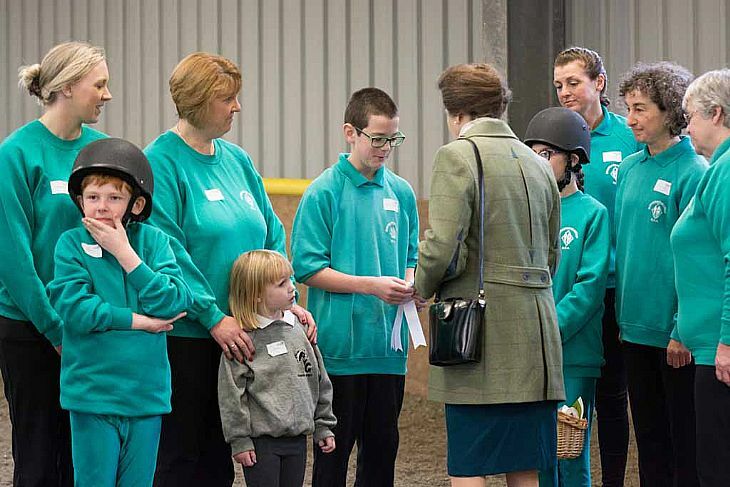 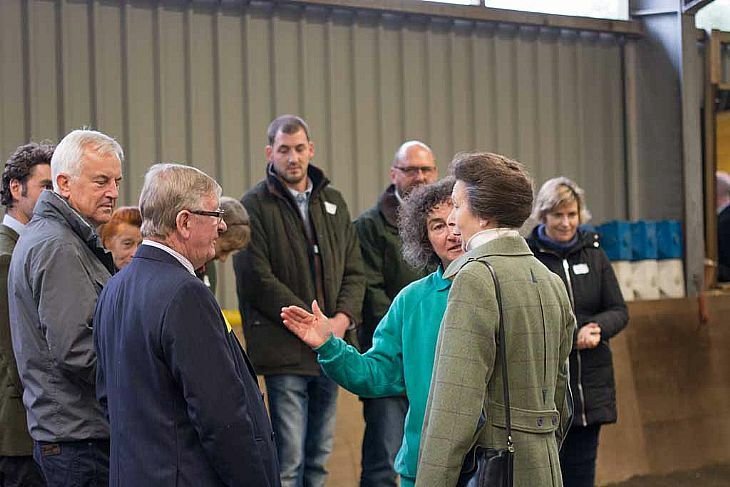 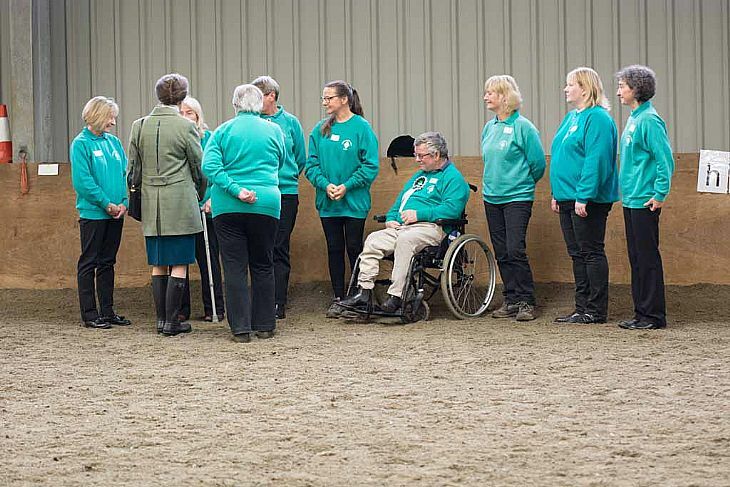 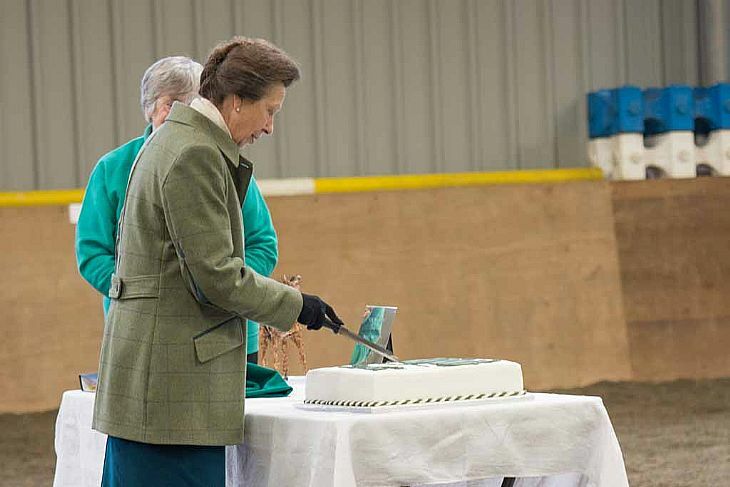 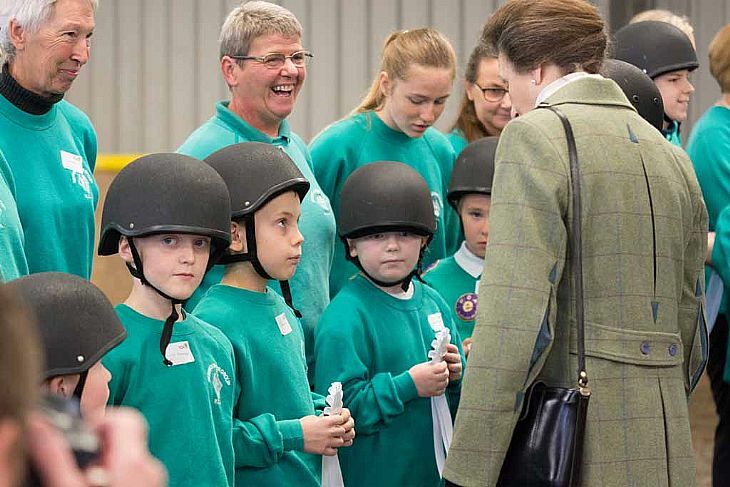 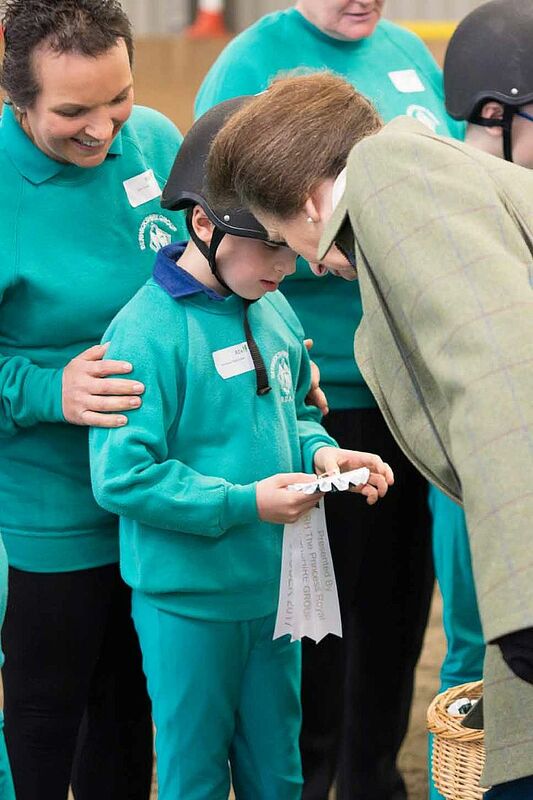 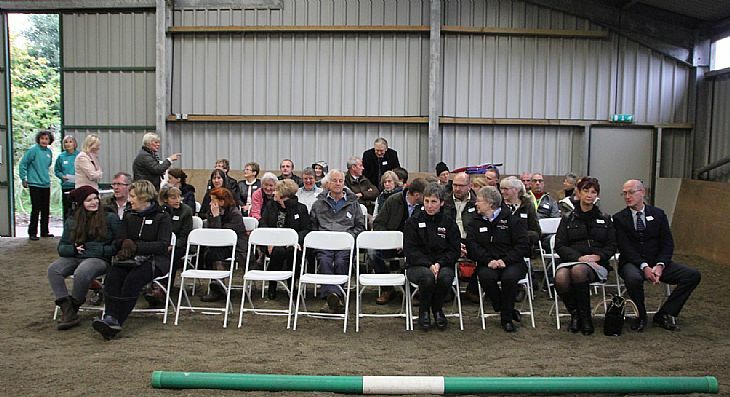 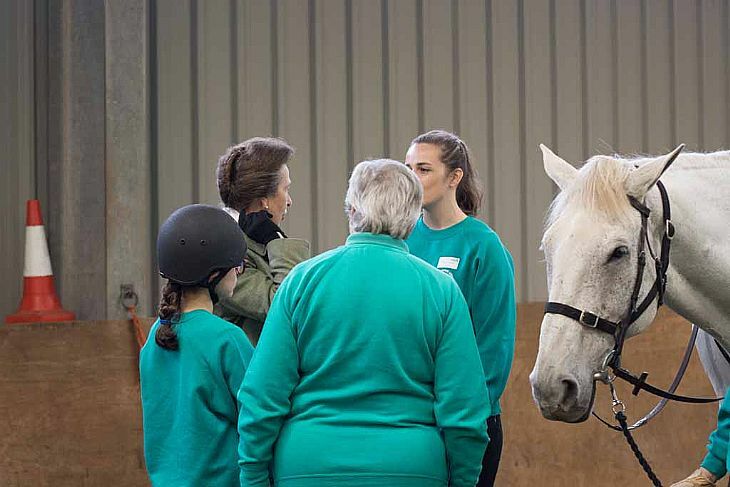 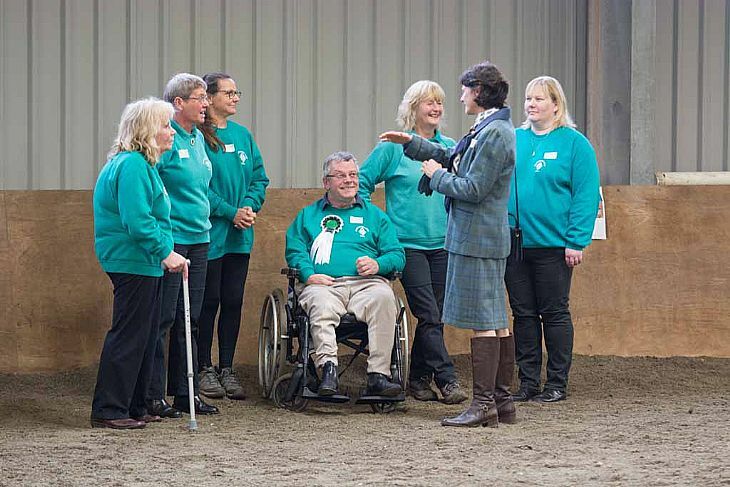 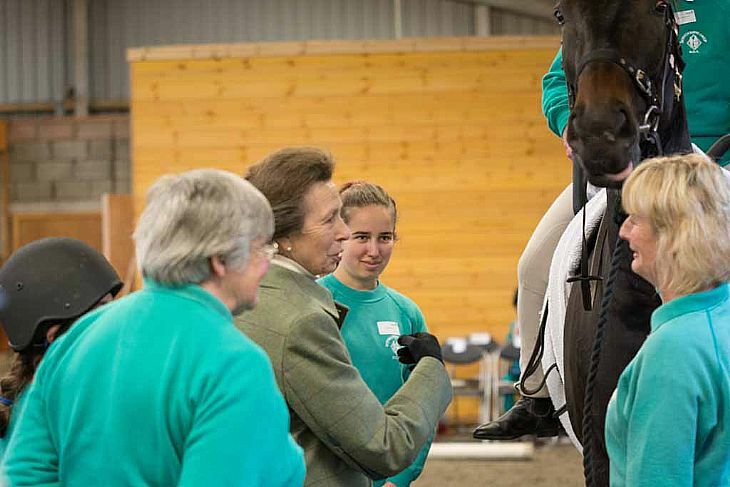 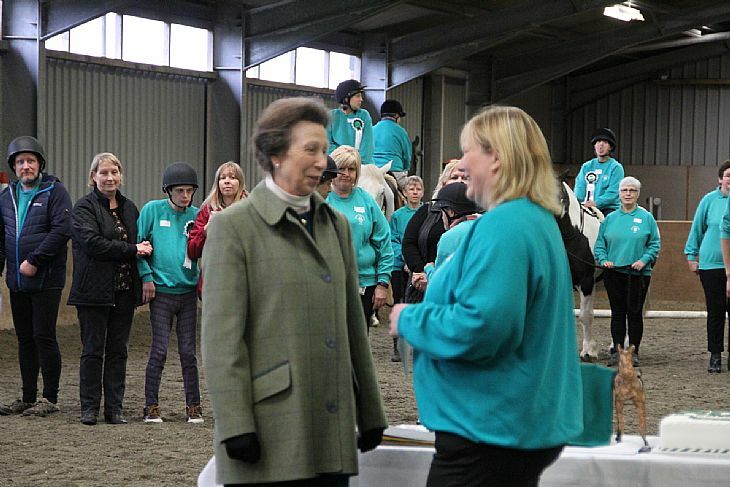 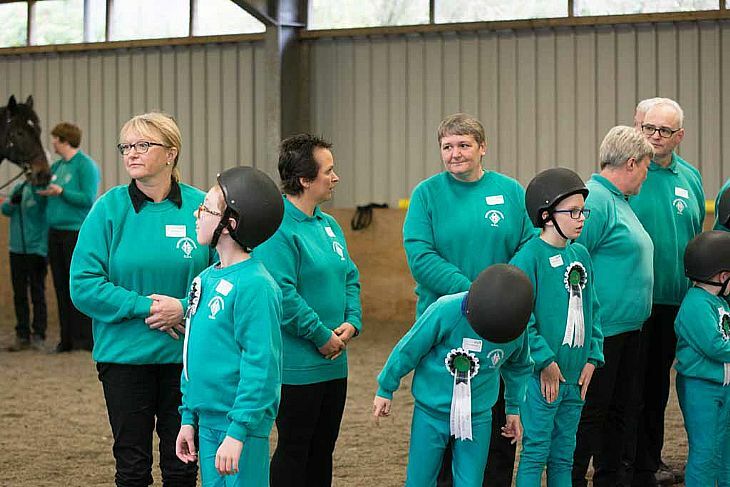 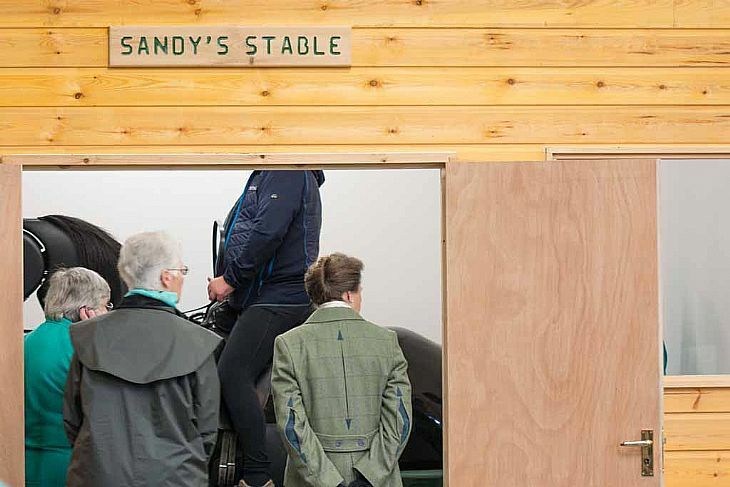 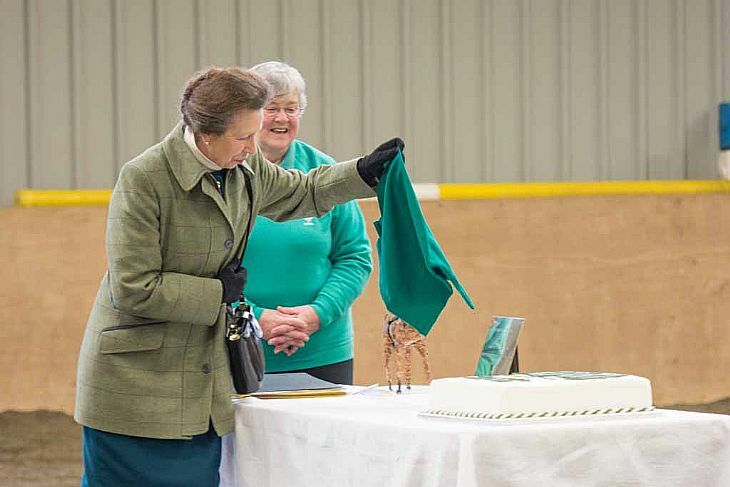 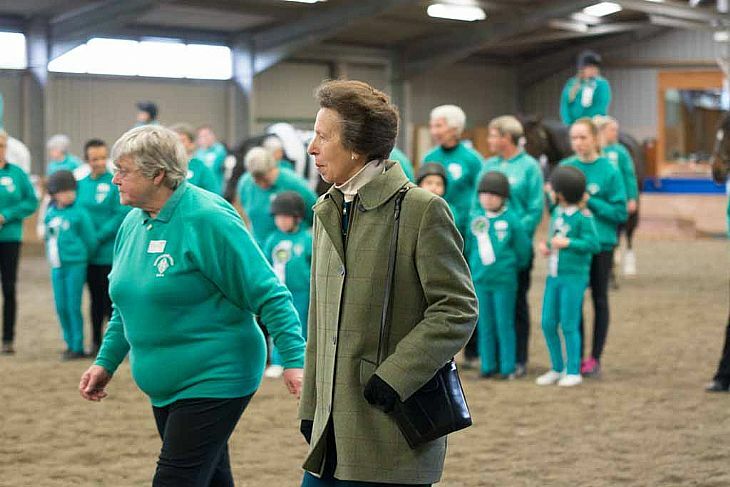 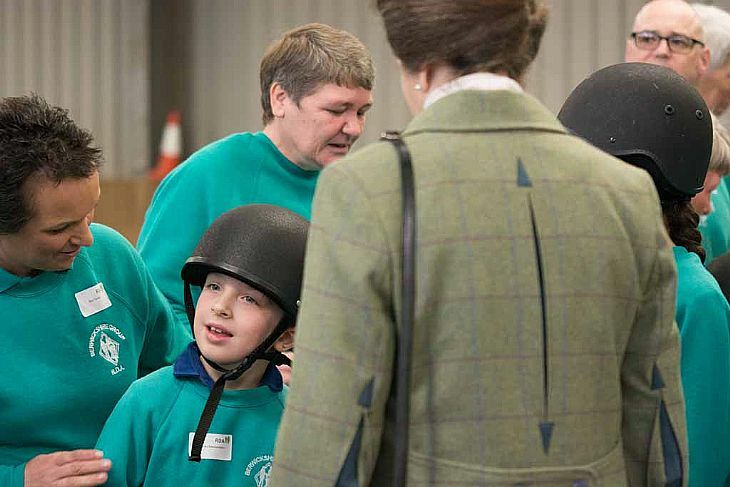 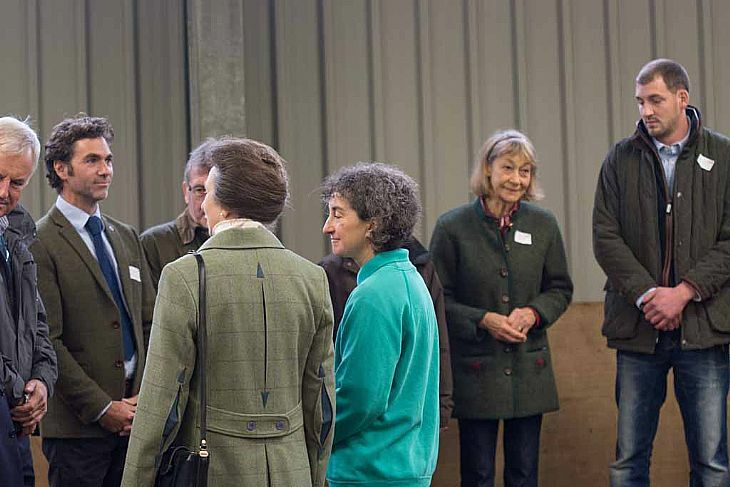 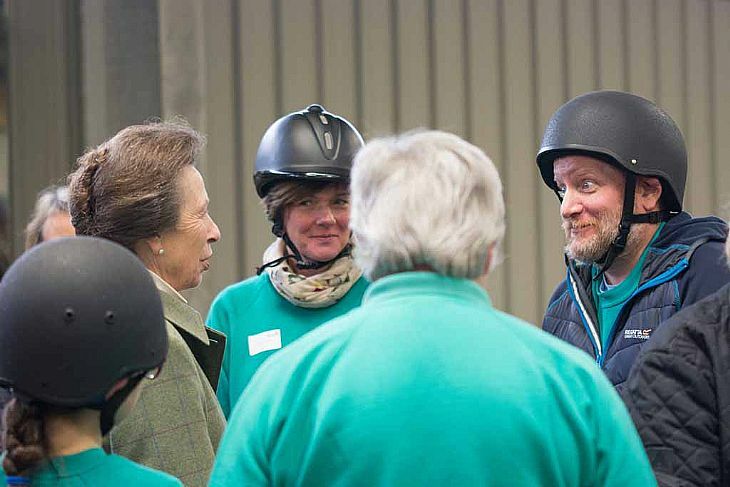 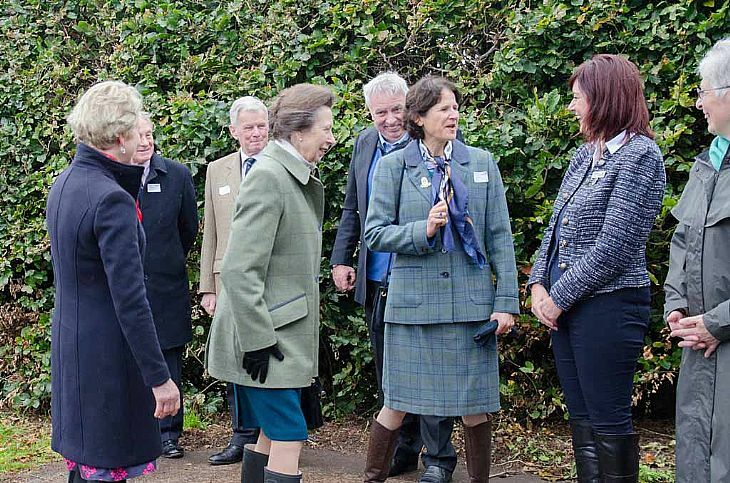 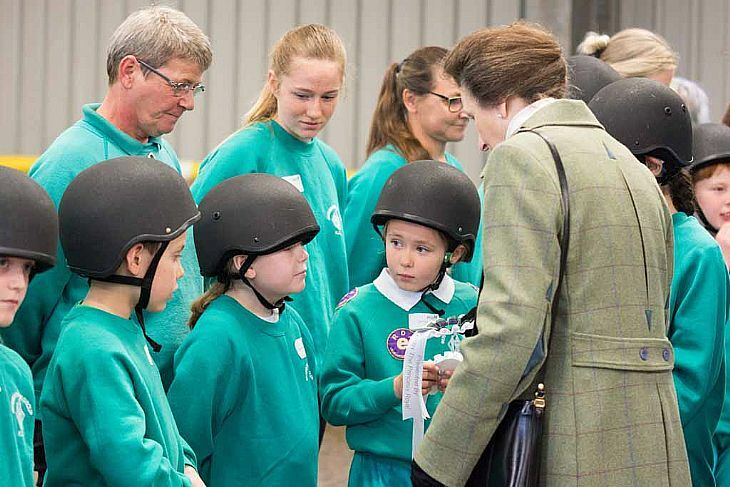 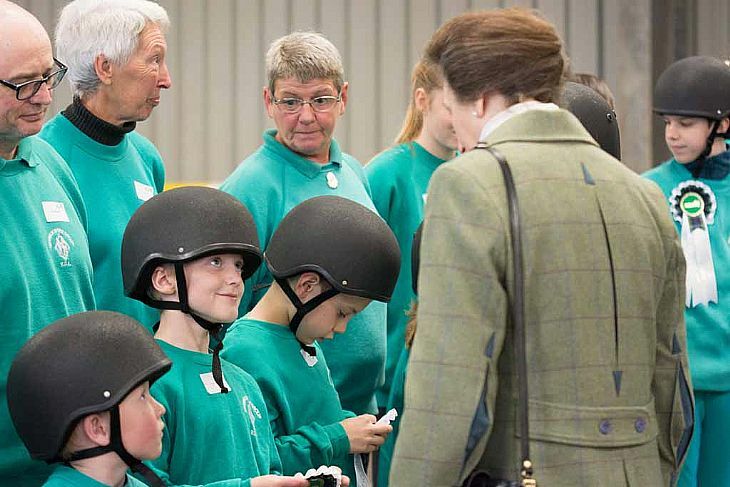 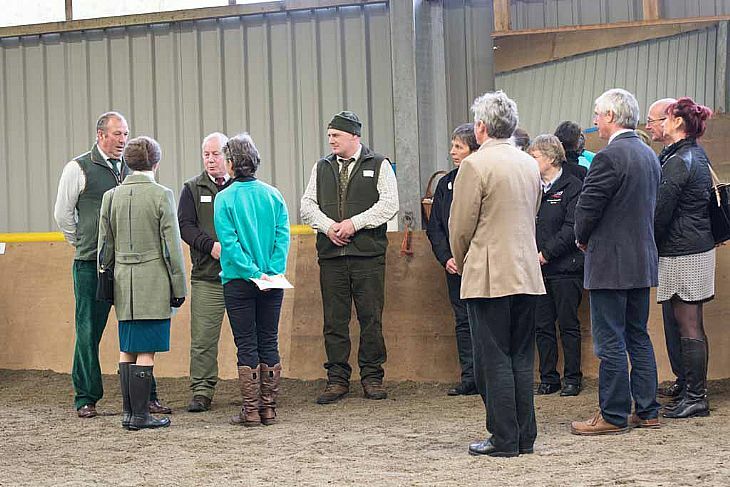 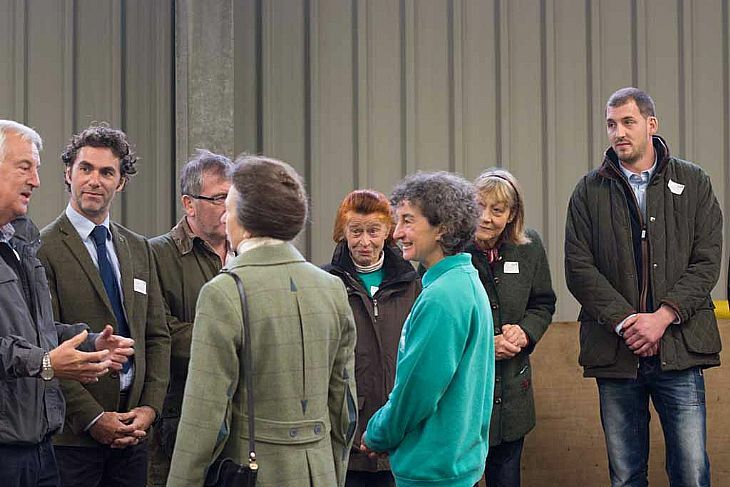 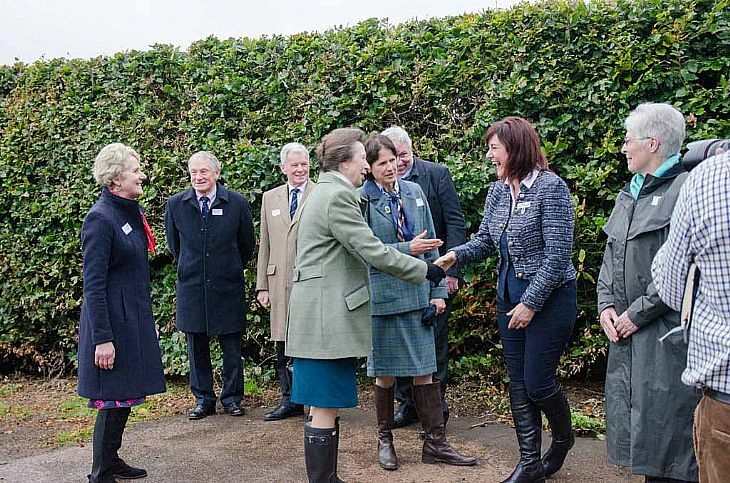 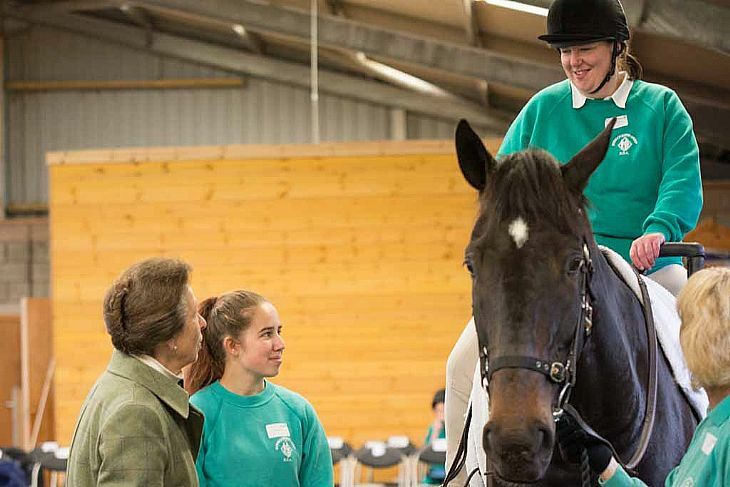 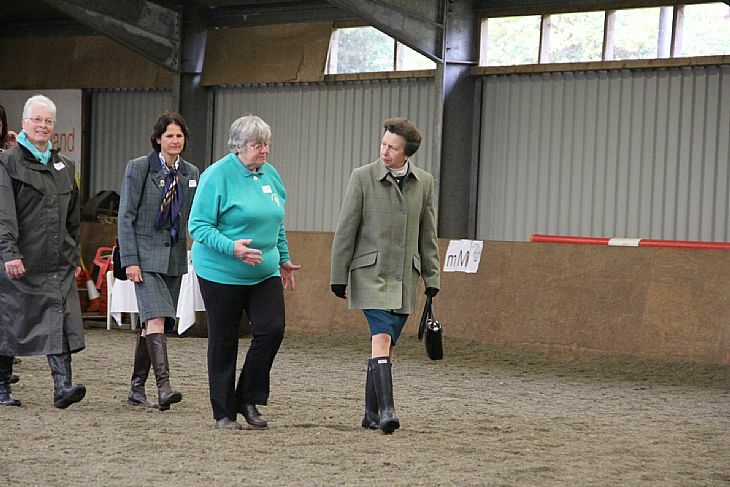 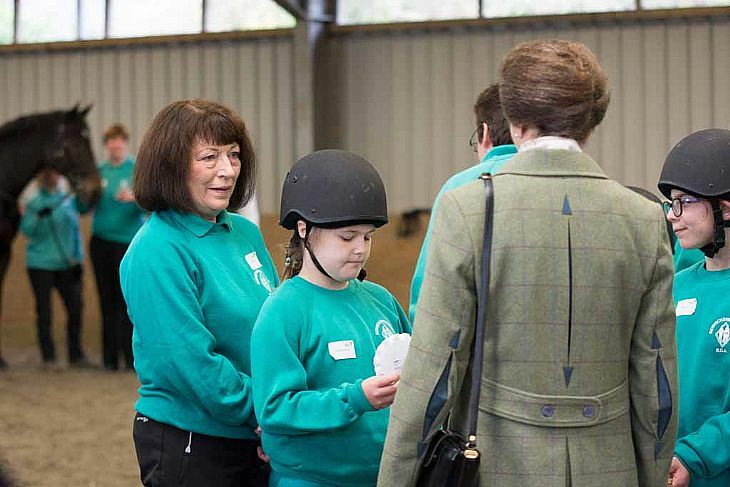 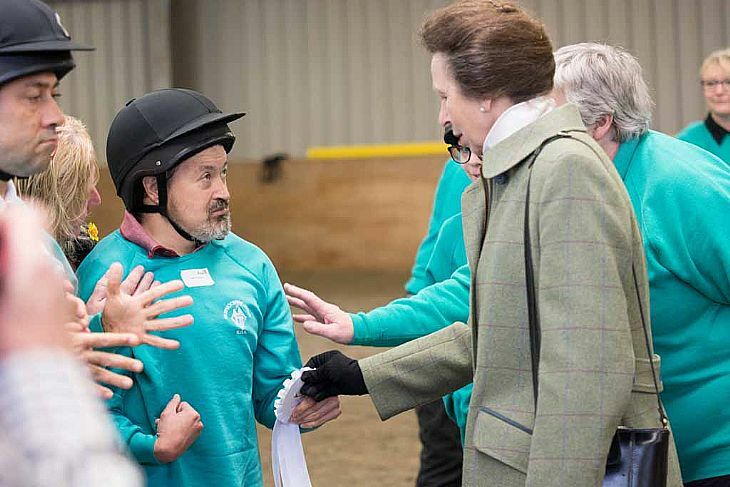 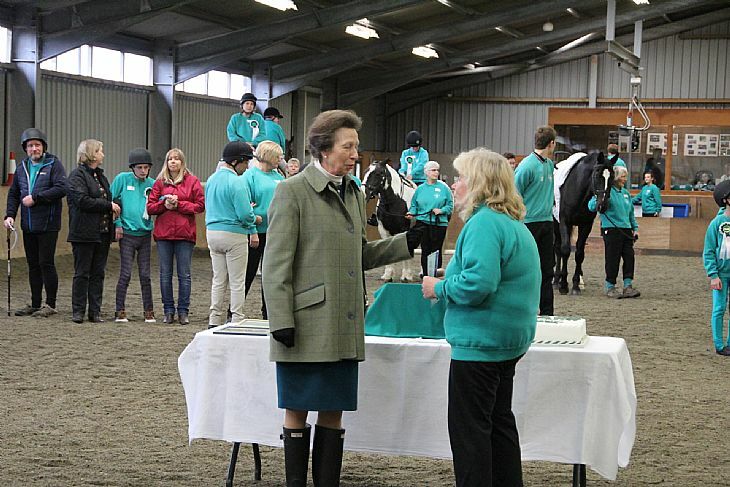 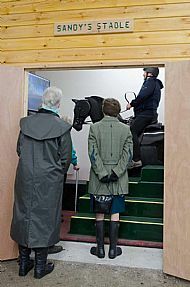 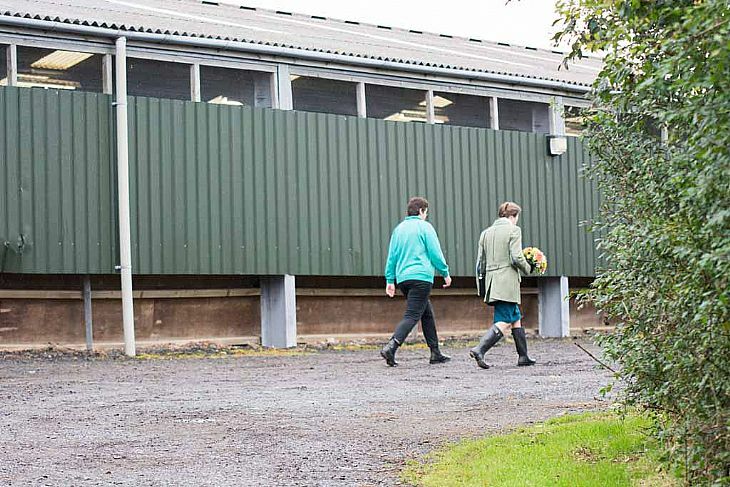 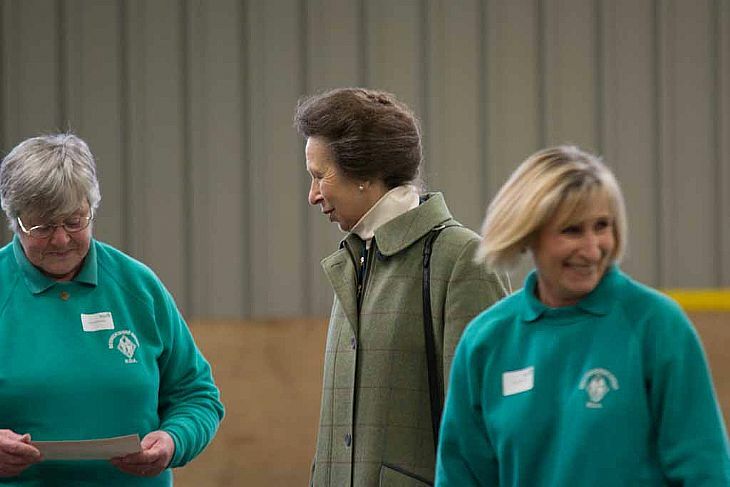 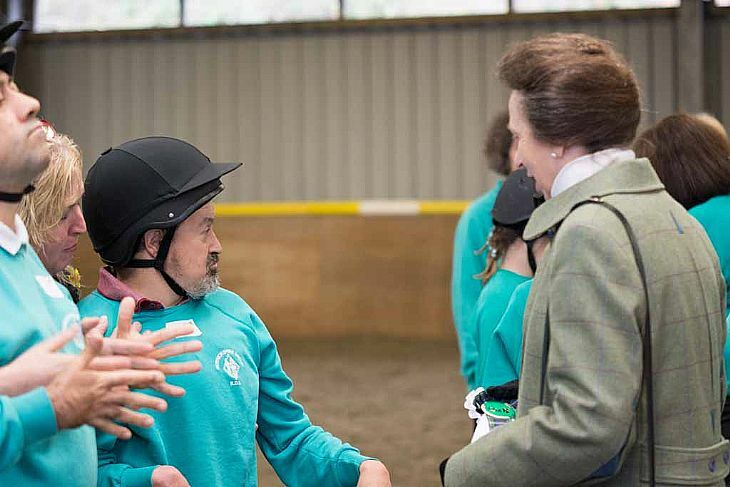 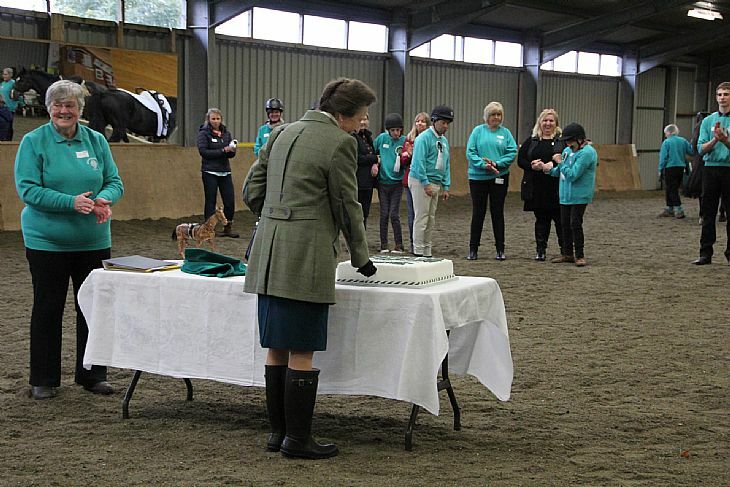 Berwickshire Group RDA was honoured to welcome HRH The Princess Royal to the Group’s arena at Sunnyside on Wednesday 11th October 2017 to mark the opening of Sandy’s Stable. 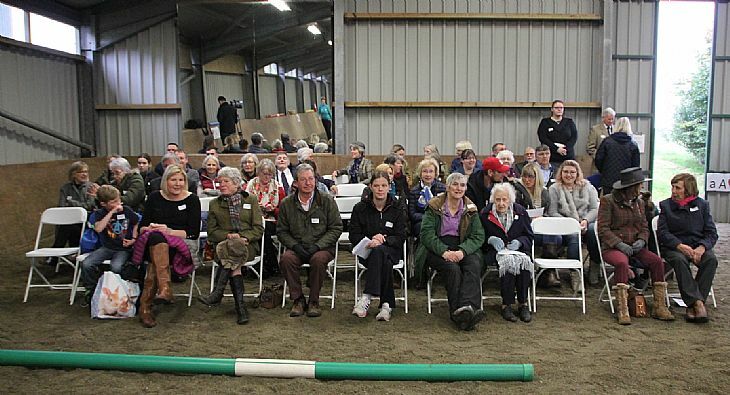 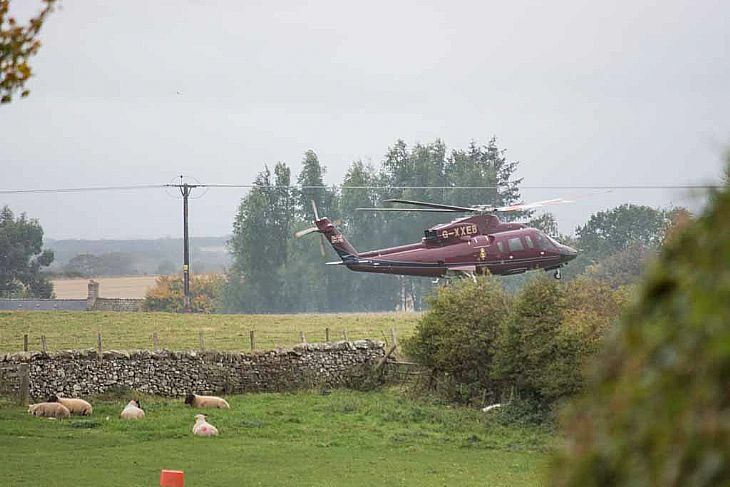 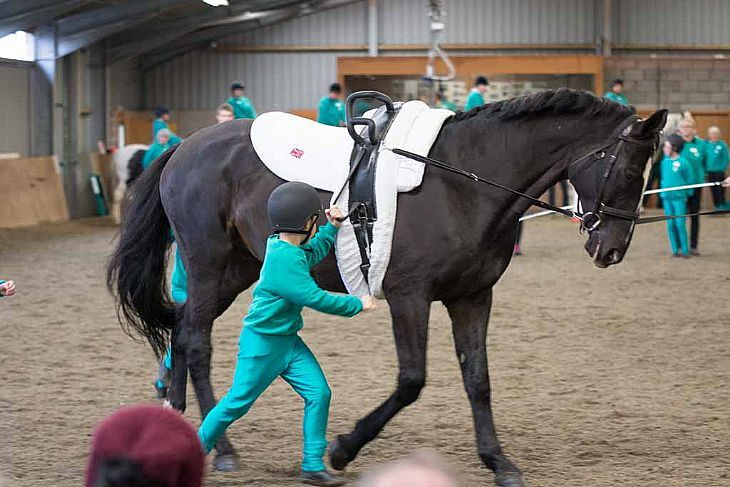 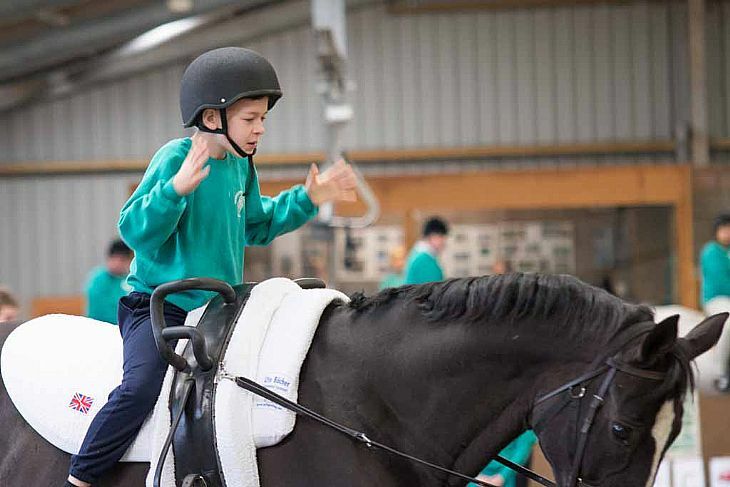 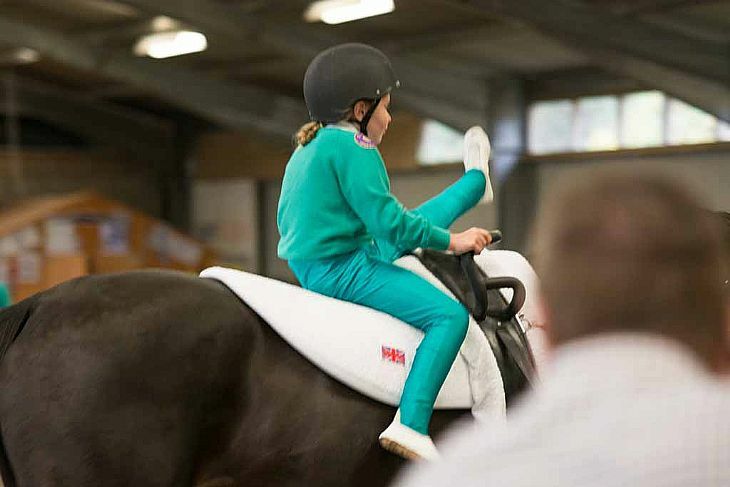 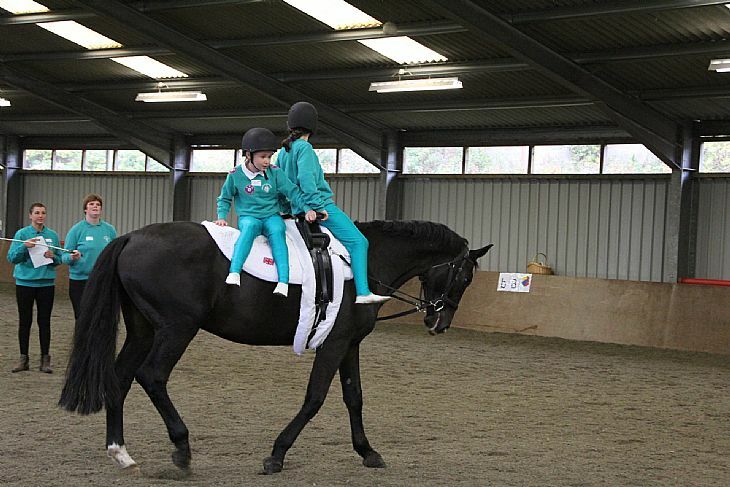 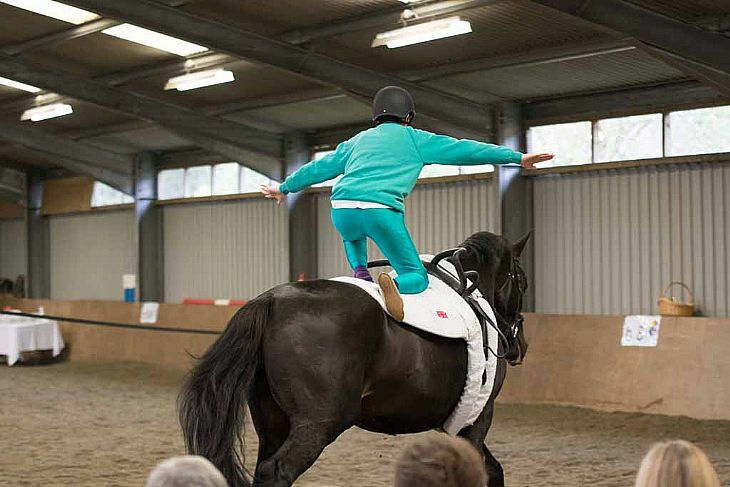 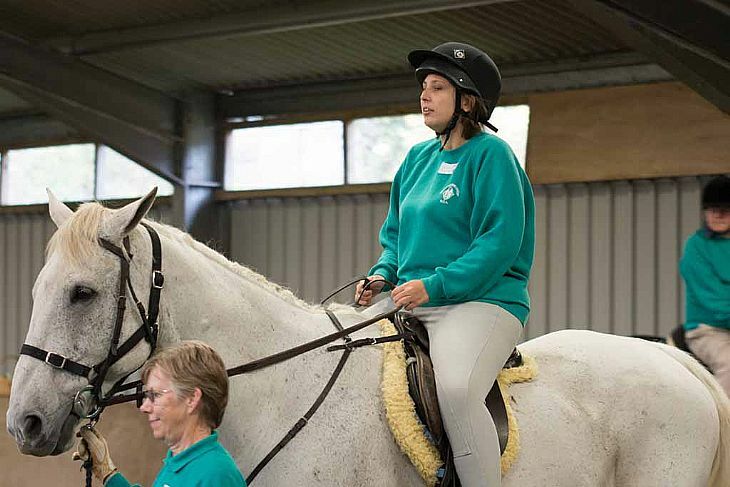 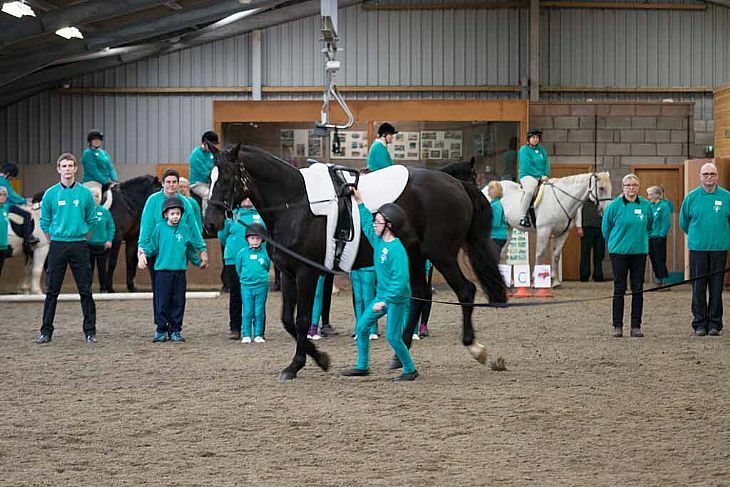 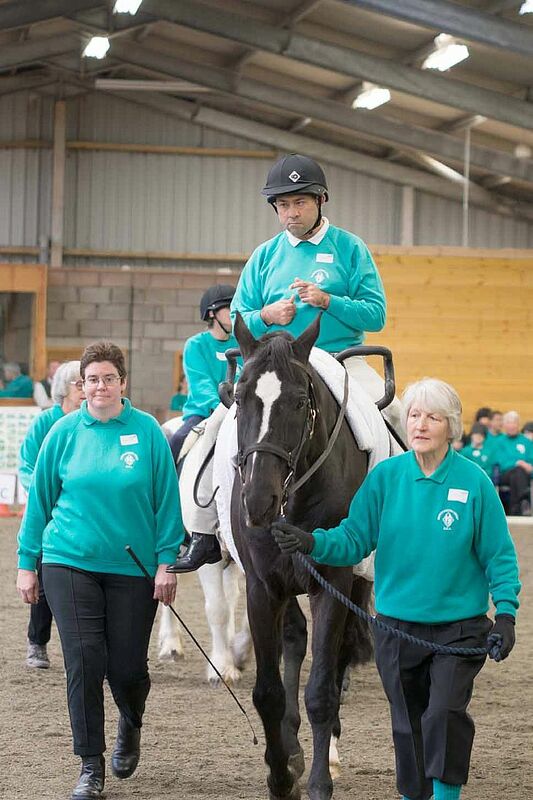 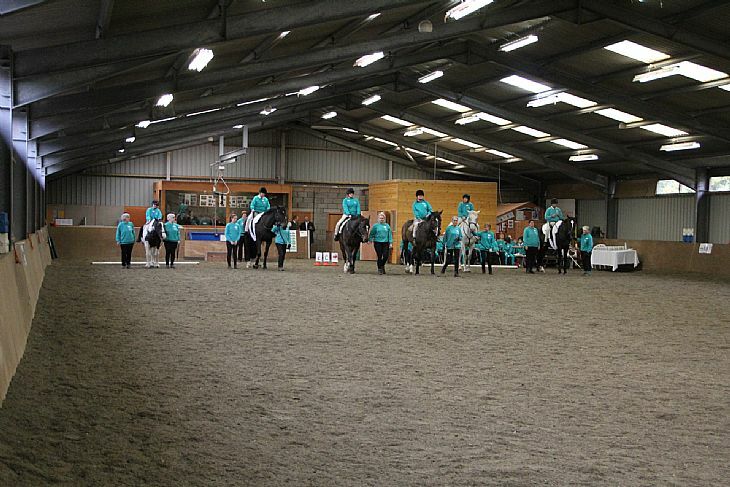 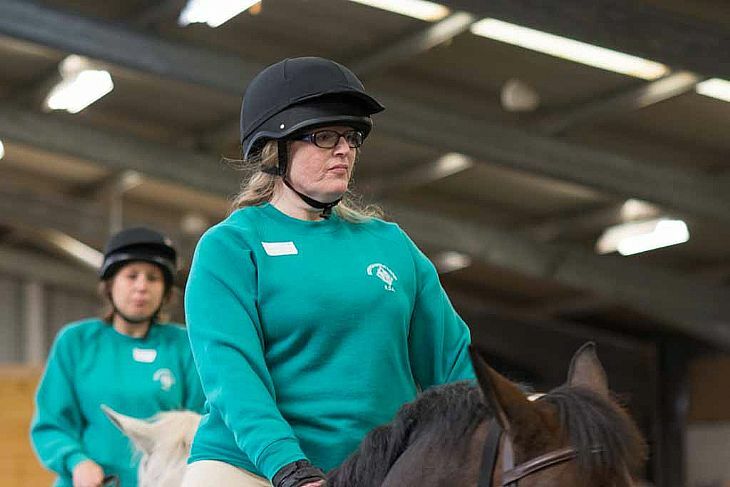 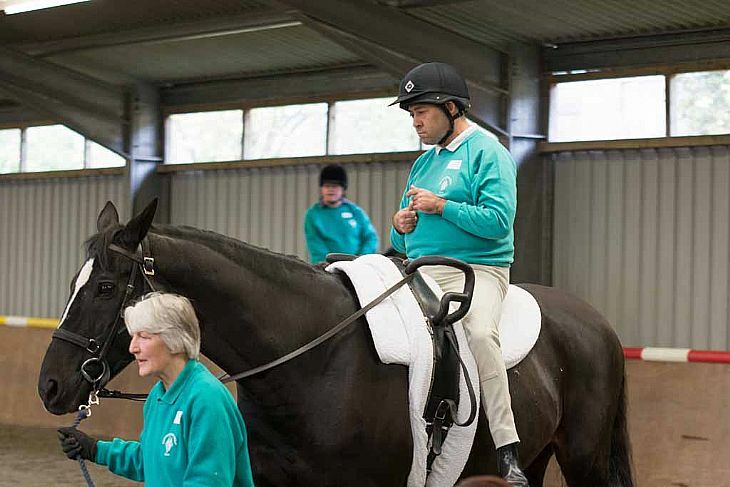 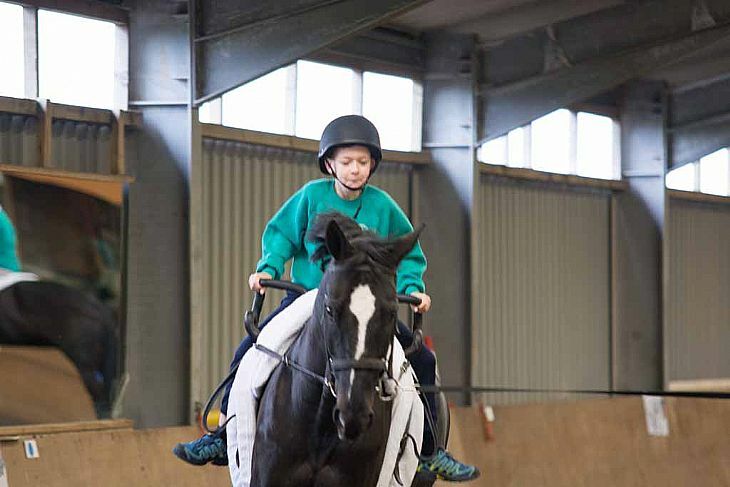 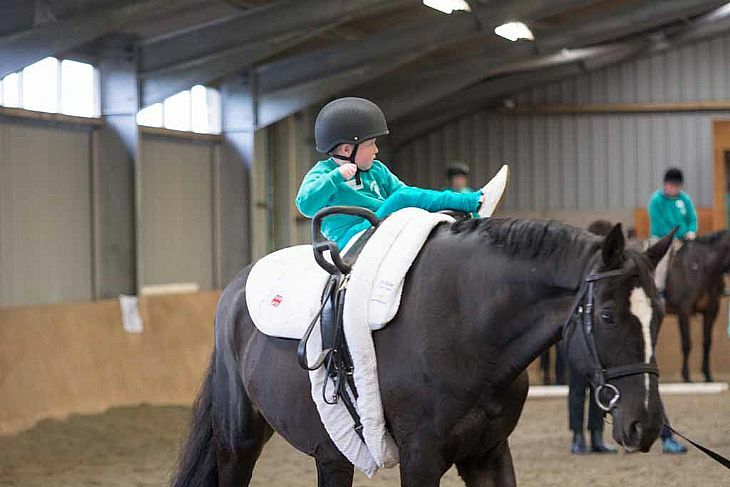 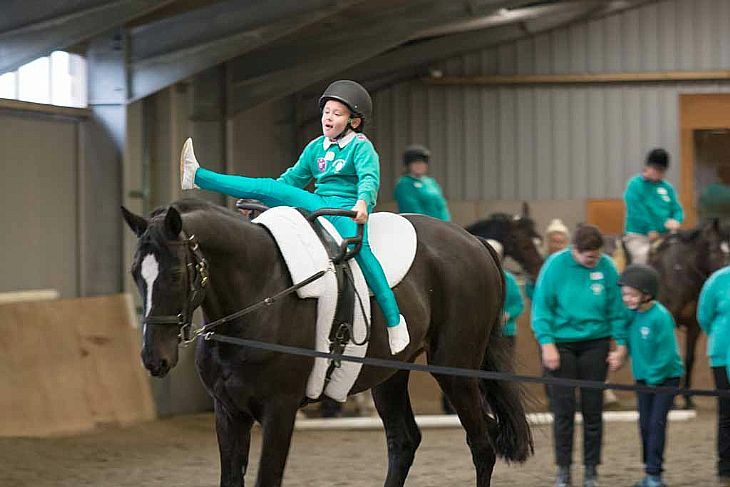 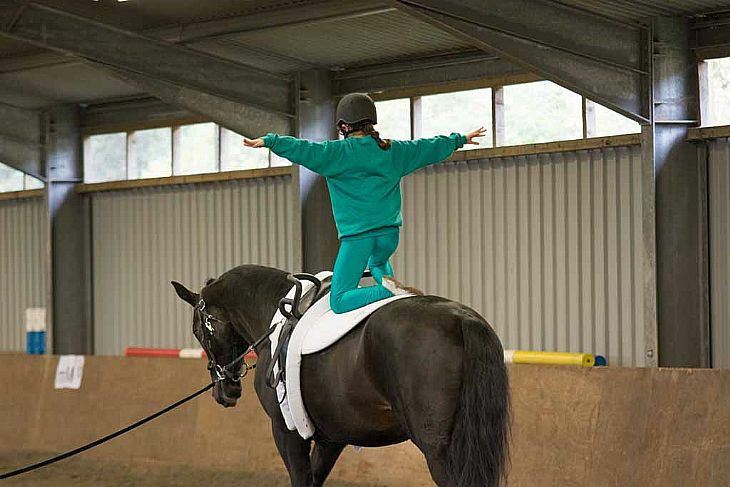 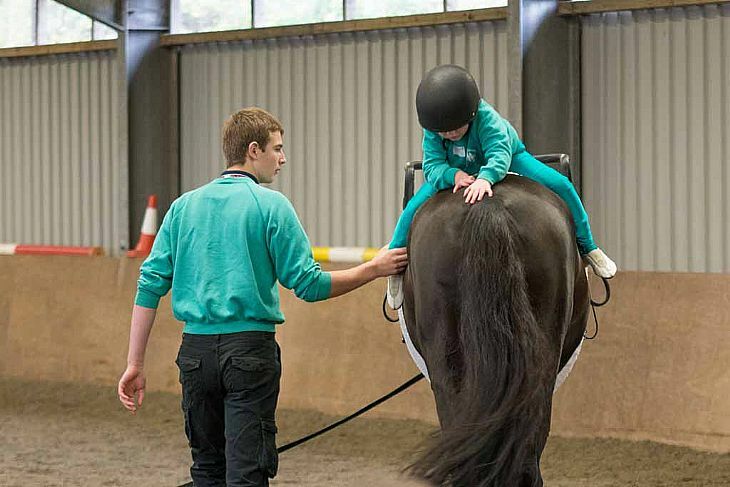 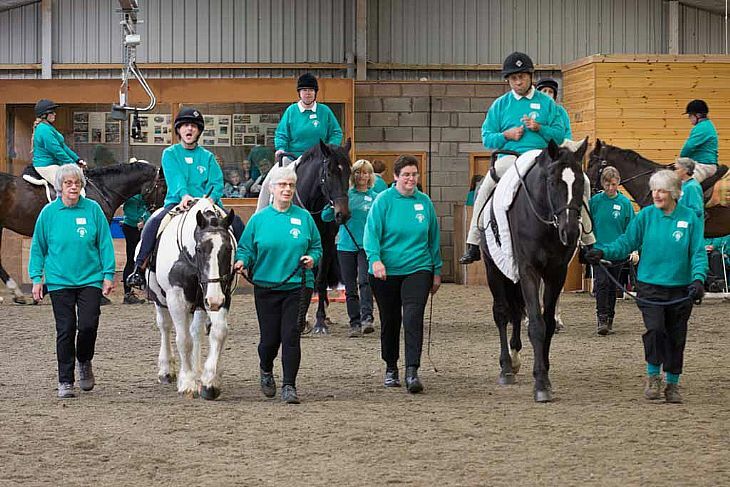 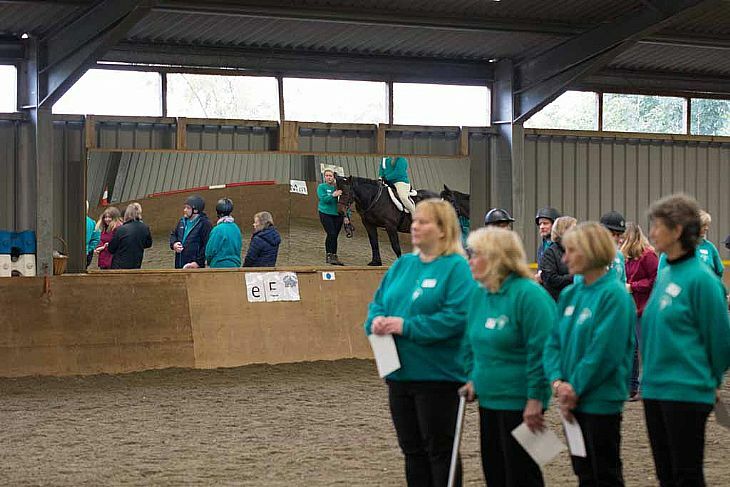 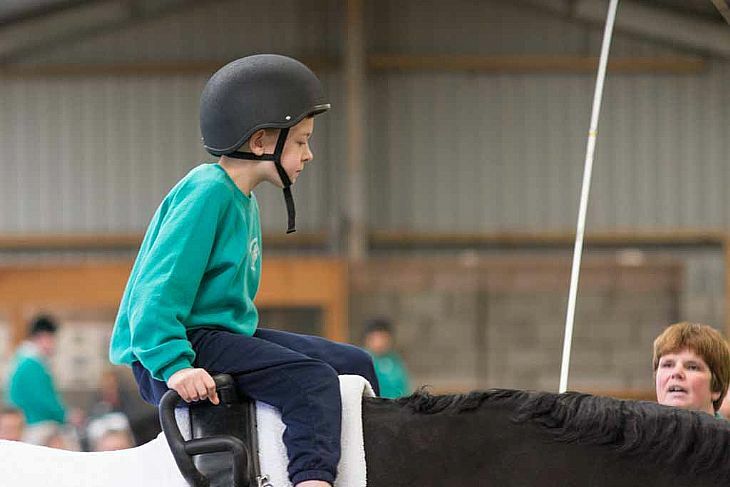 Over 100 invited guests and supporters were present along with Group riders, vaulters and helpers. 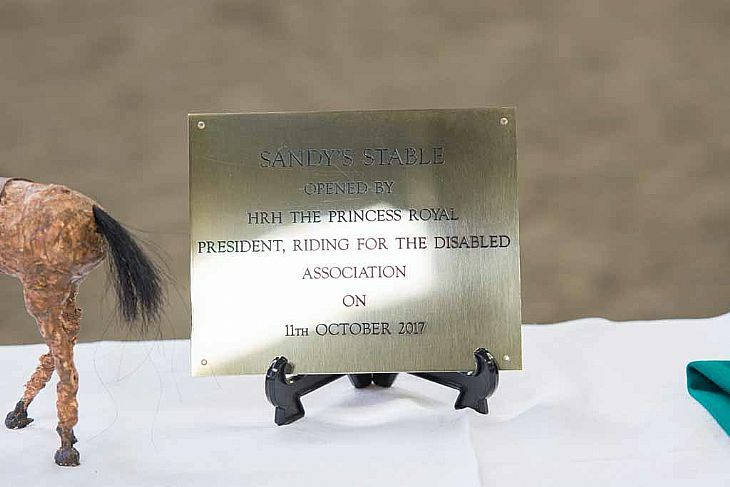 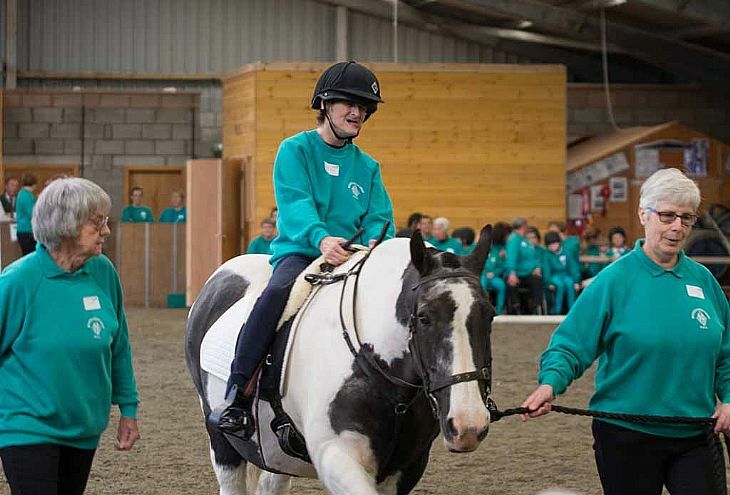 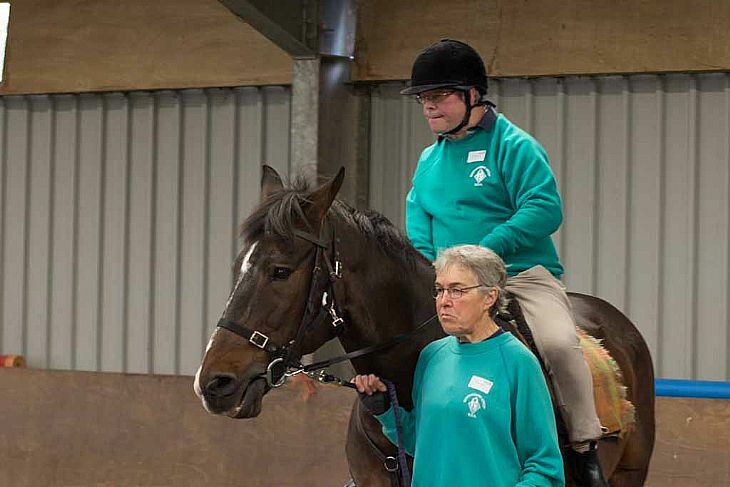 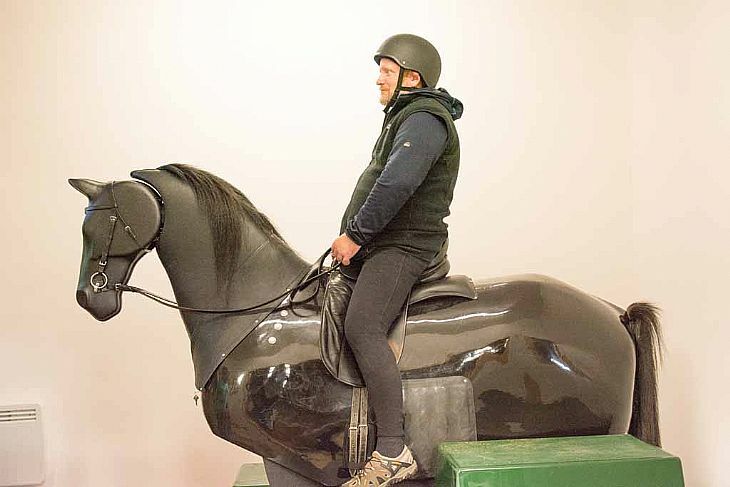 Sandy the mechanical horse was purchased recently by the Group as a result of fund-raising efforts and the generous donations of businesses and supporters both locally and from further afield. 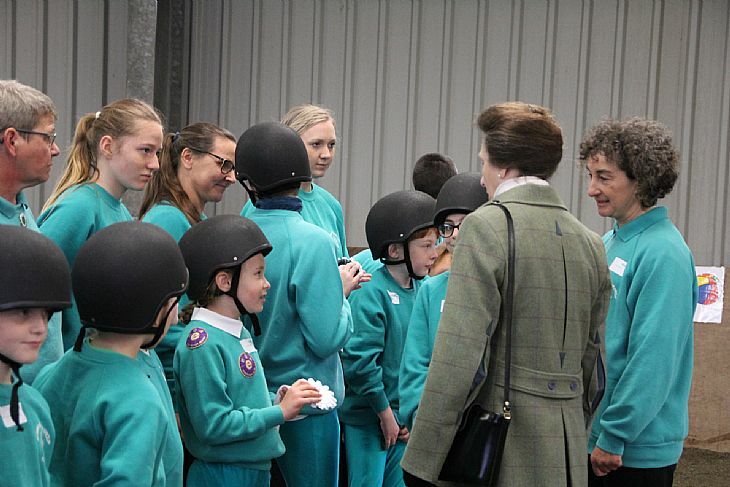 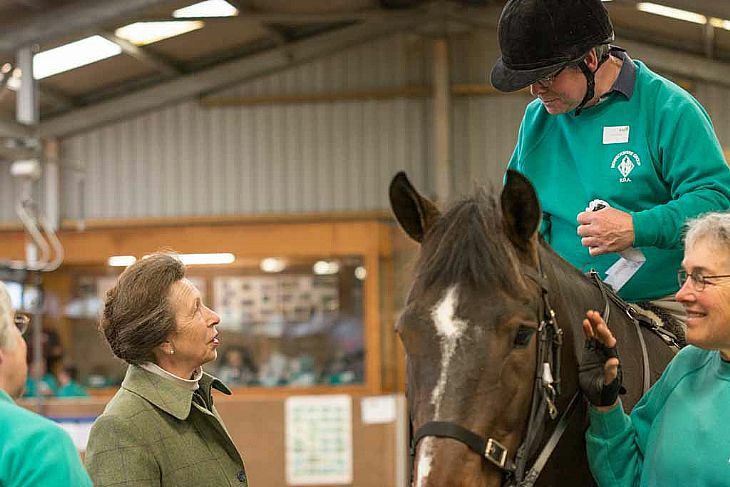 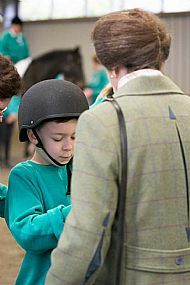 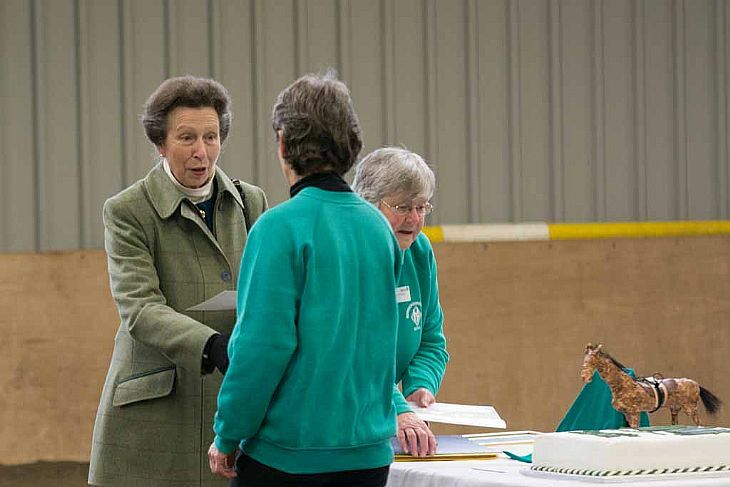 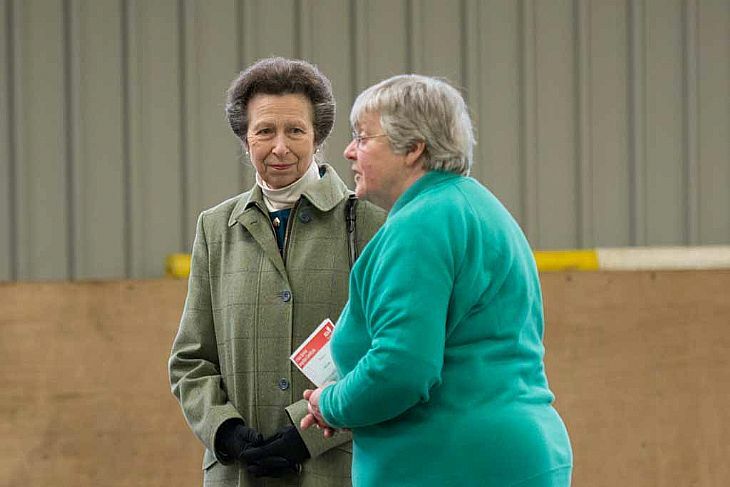 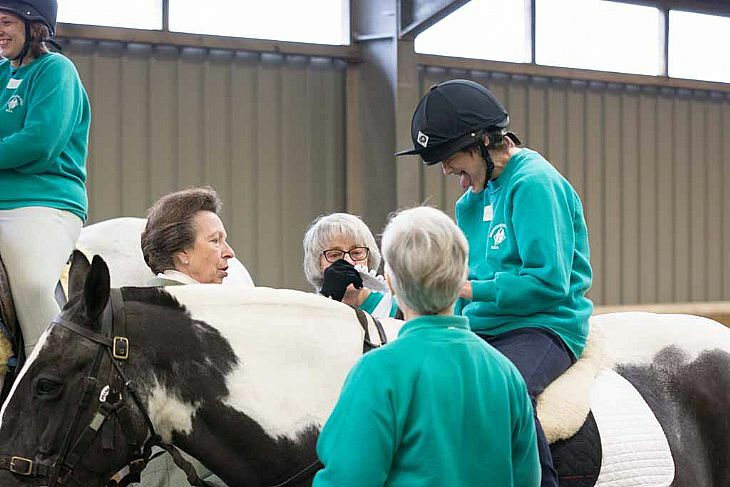 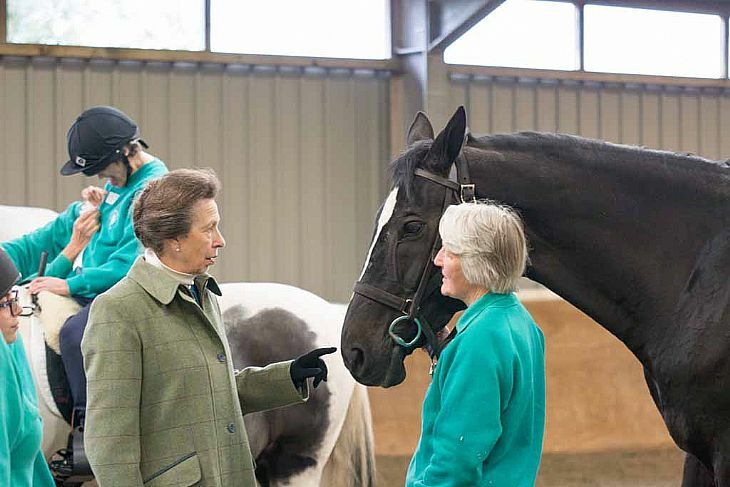 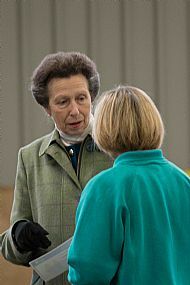 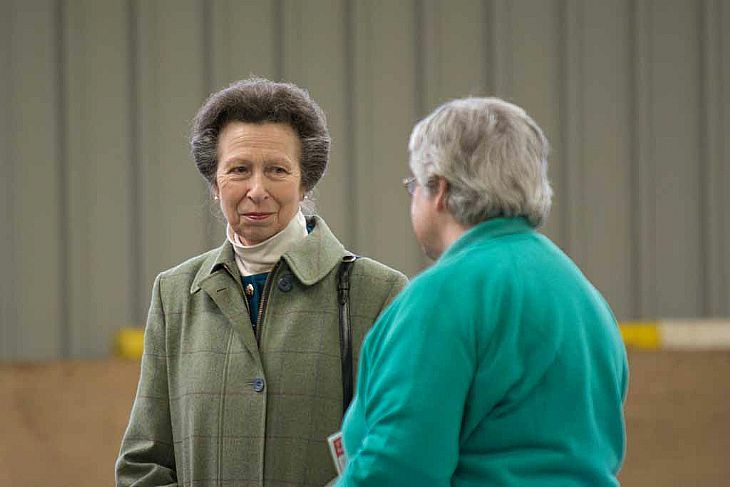 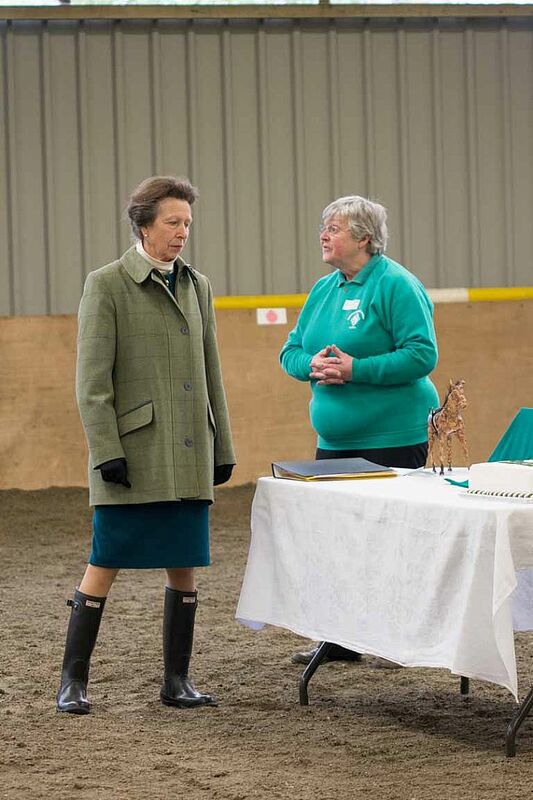 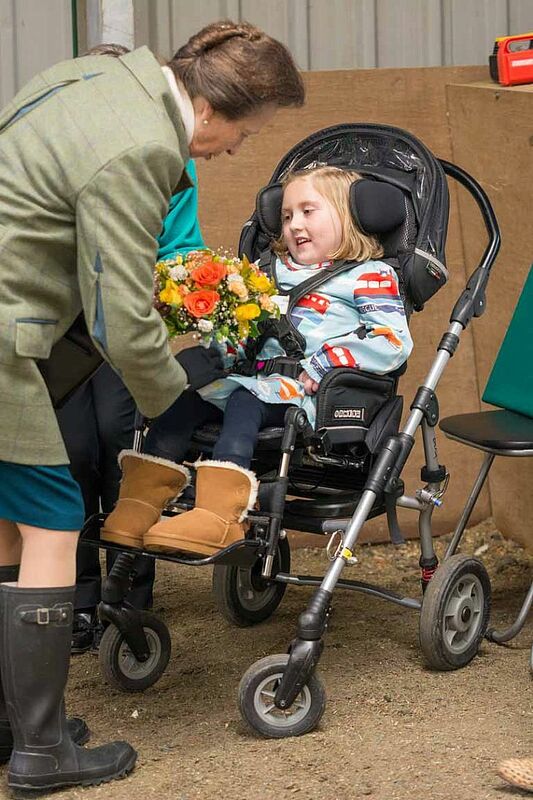 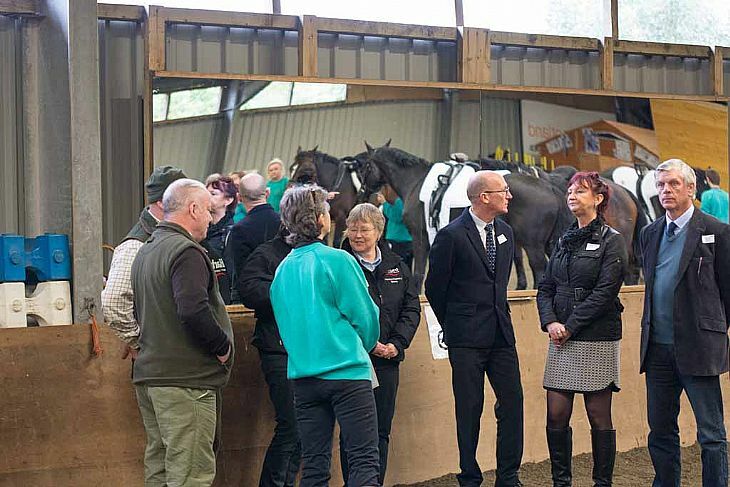 HRH The Princess Royal was shown a demonstration of Sandy with an explanation of the therapeutic benefits of the mechanical horse. 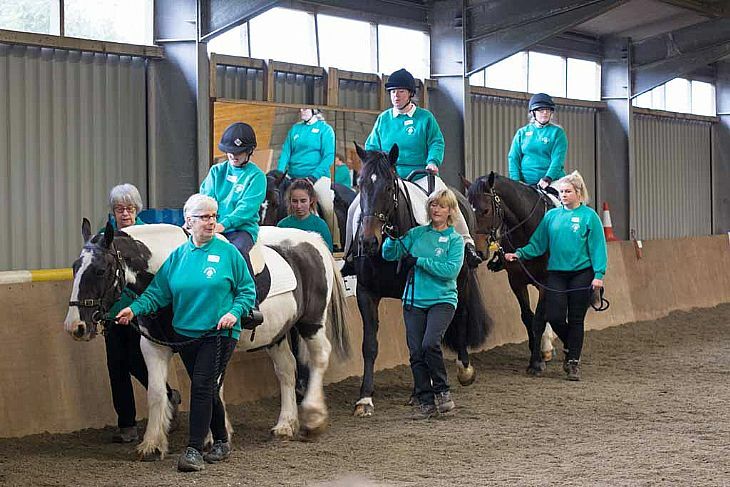 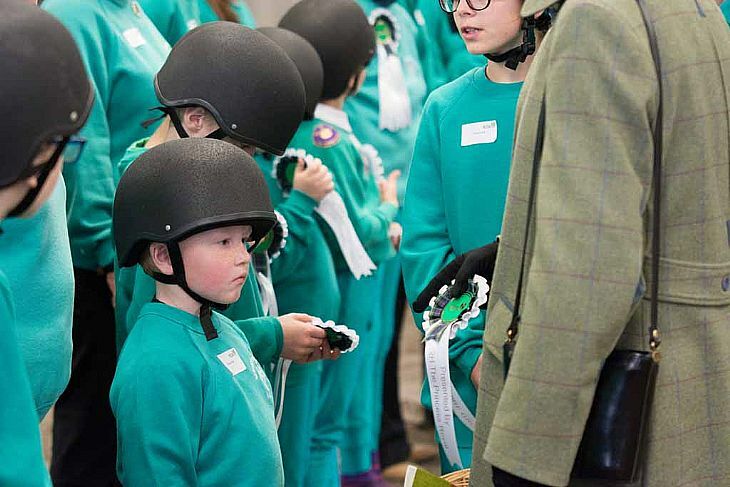 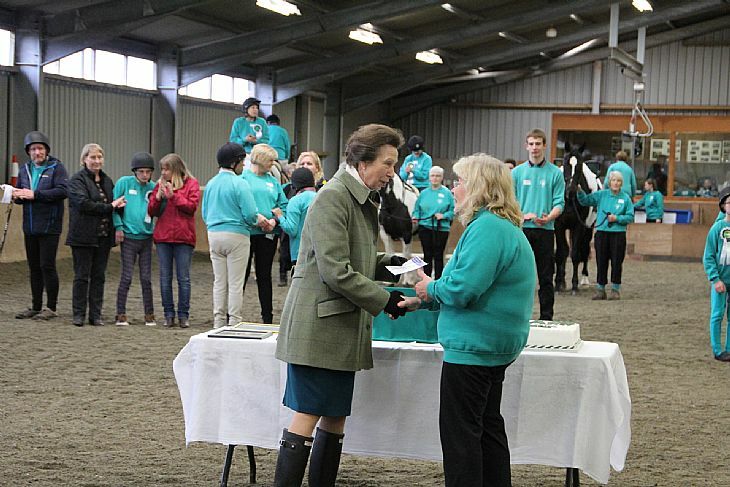 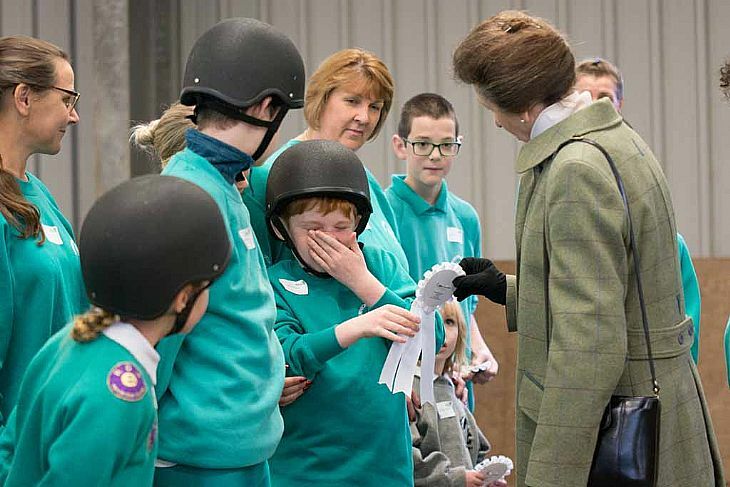 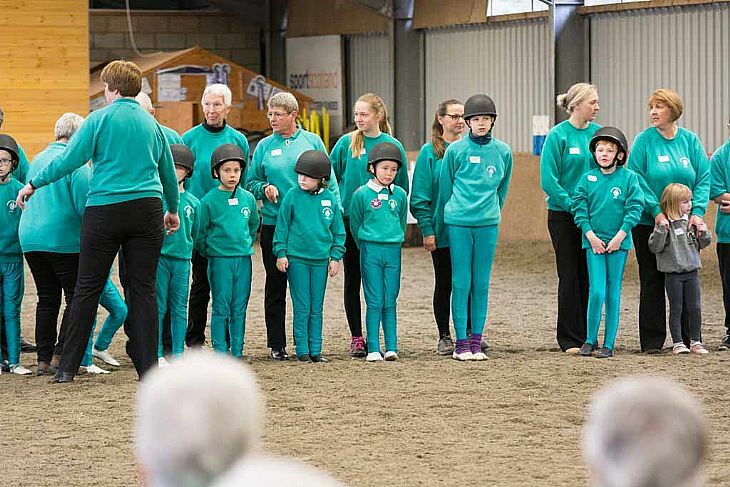 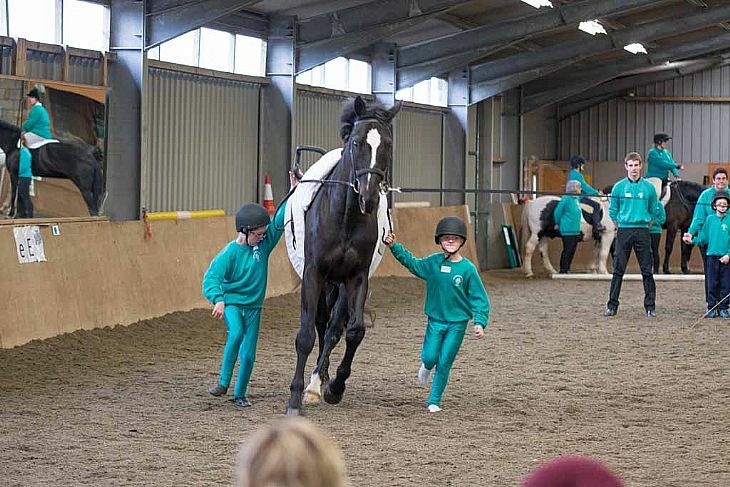 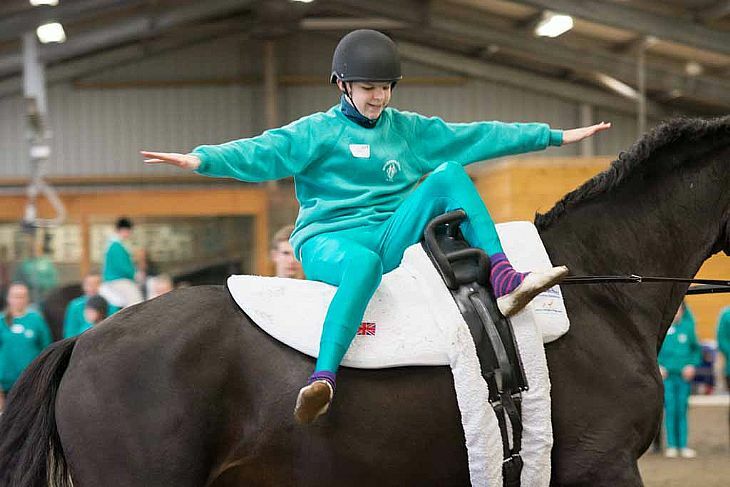 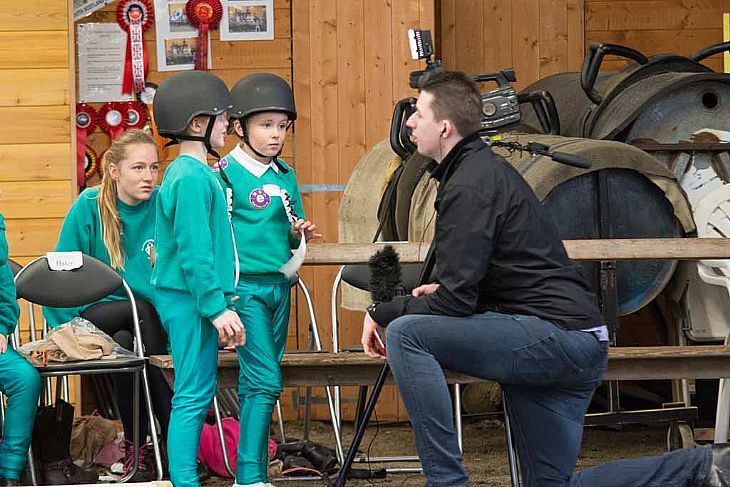 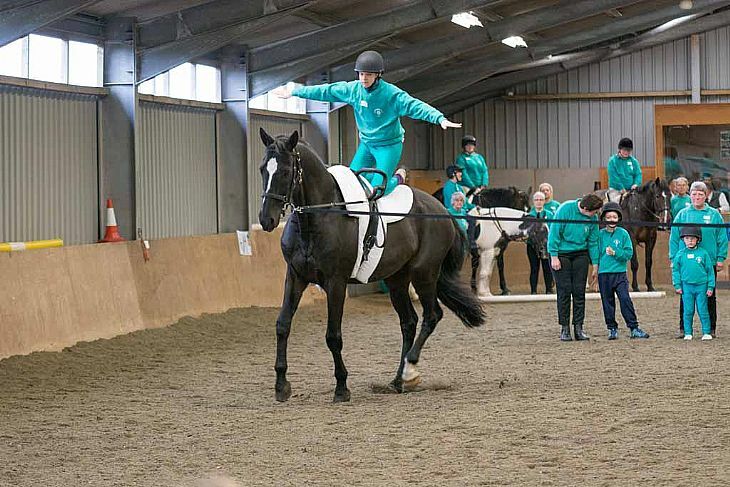 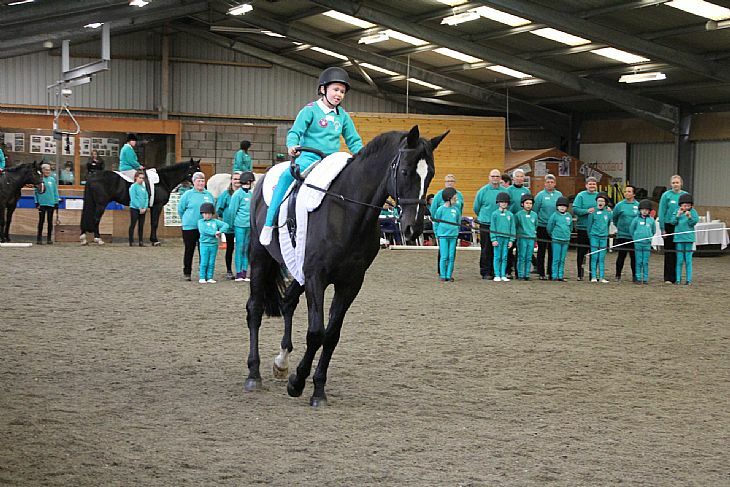 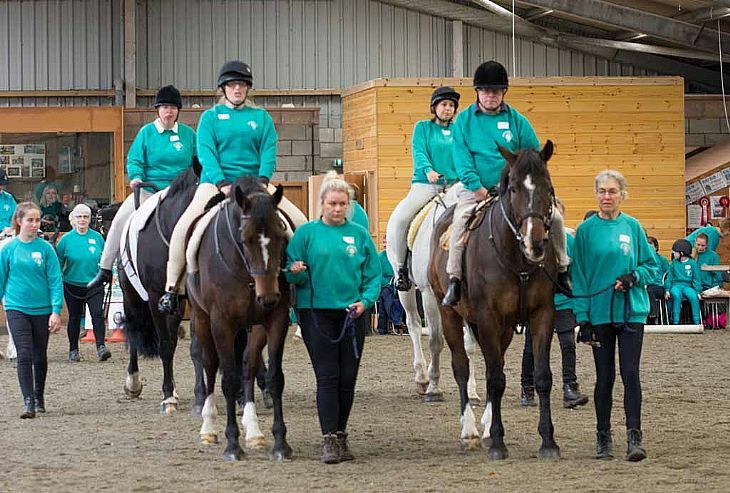 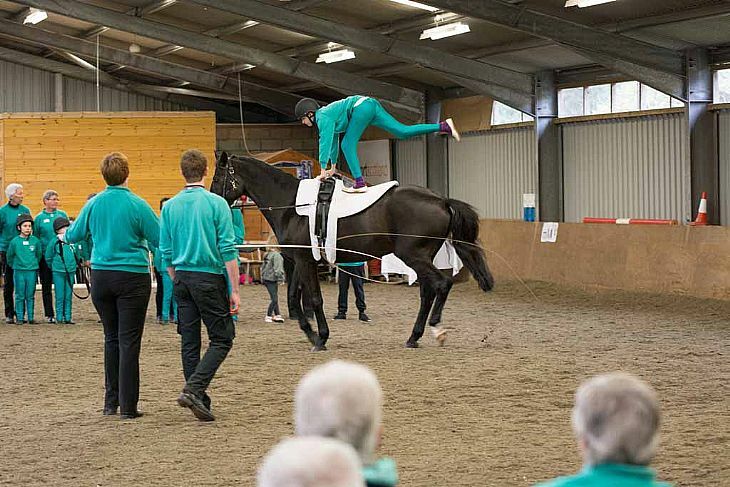 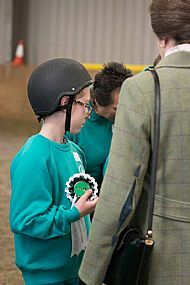 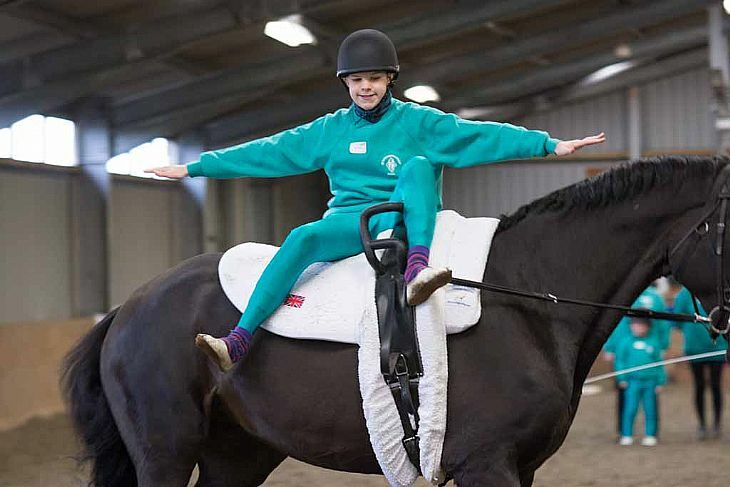 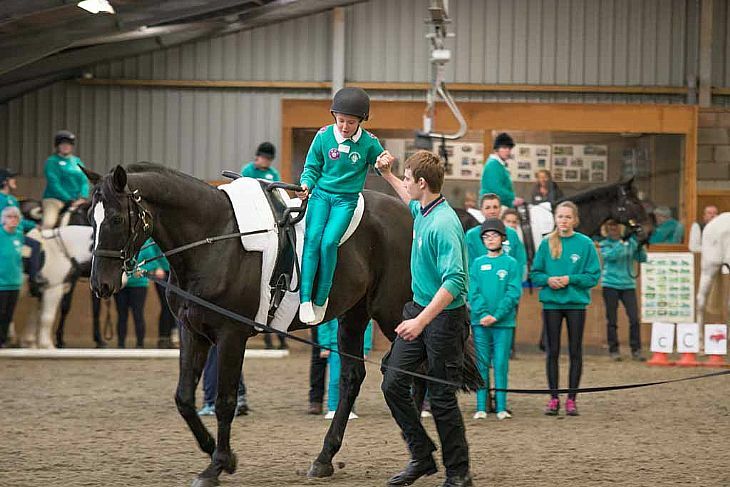 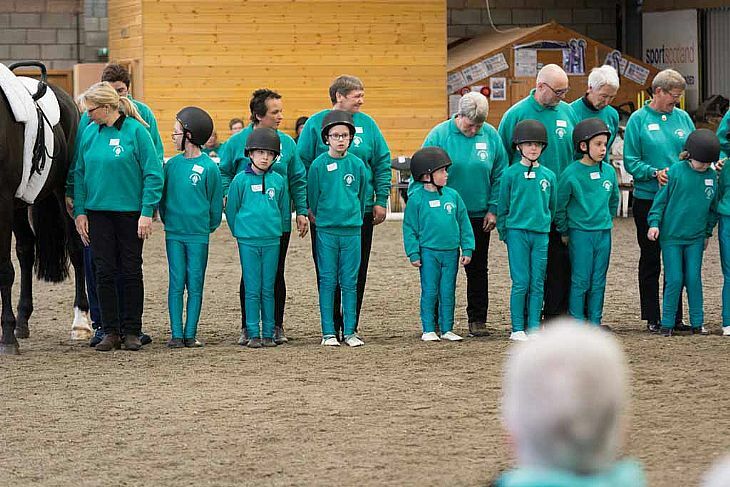 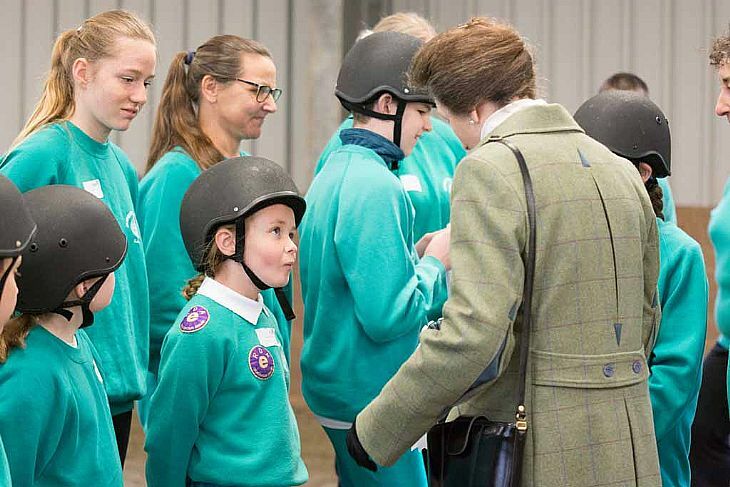 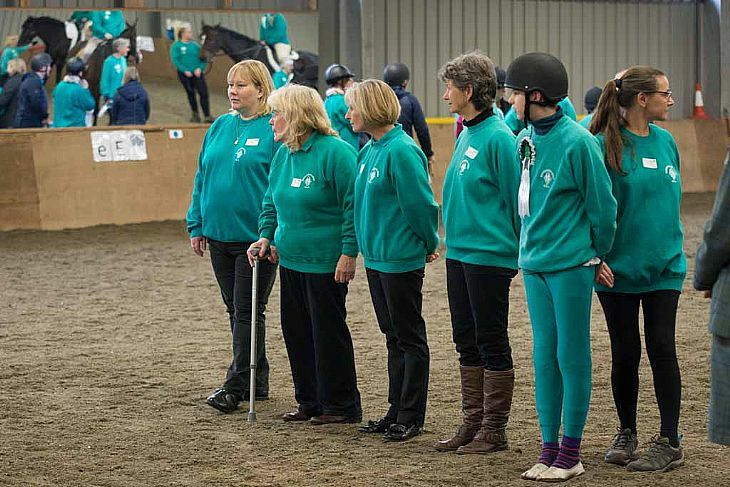 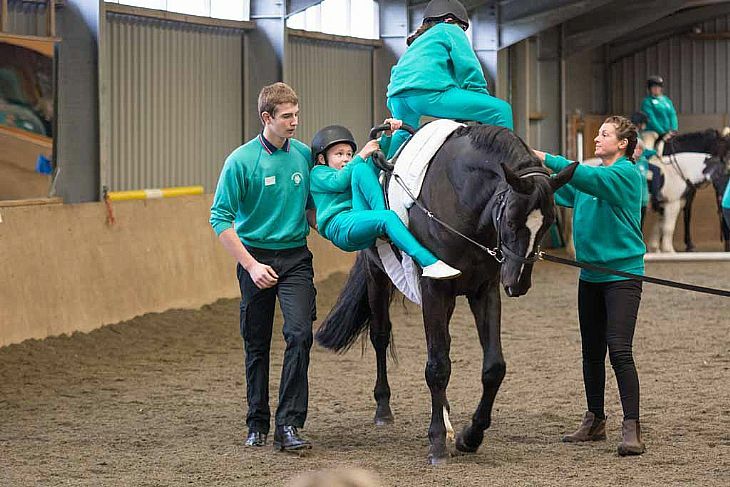 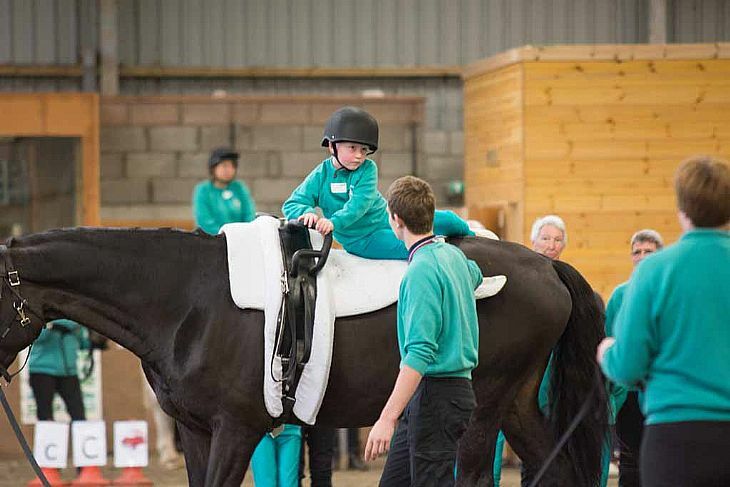 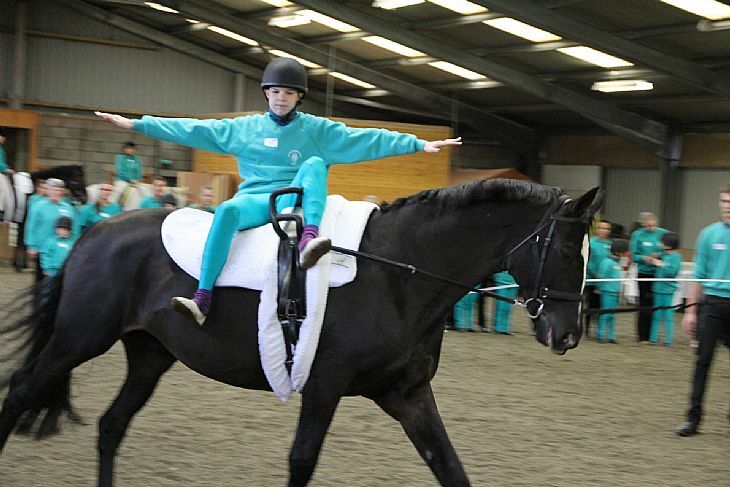 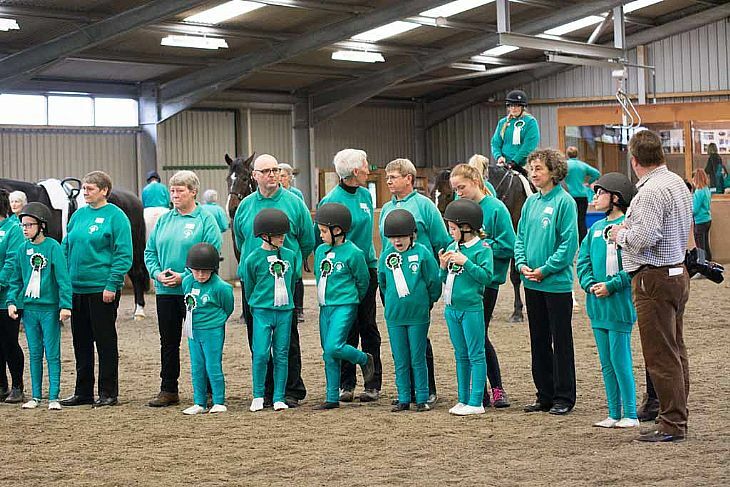 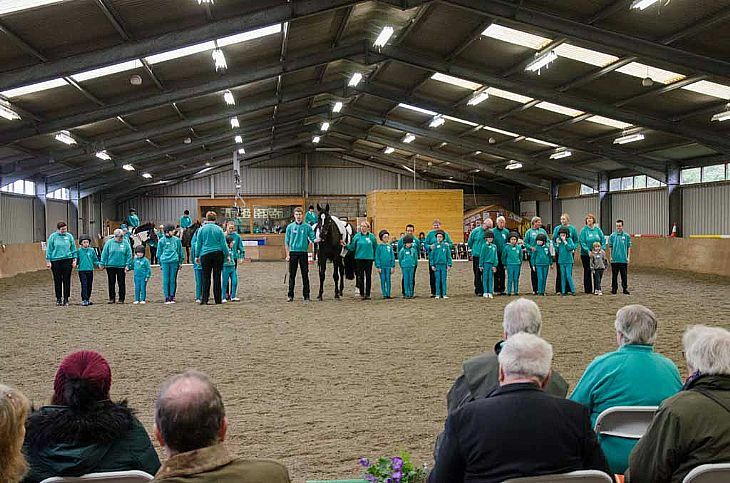 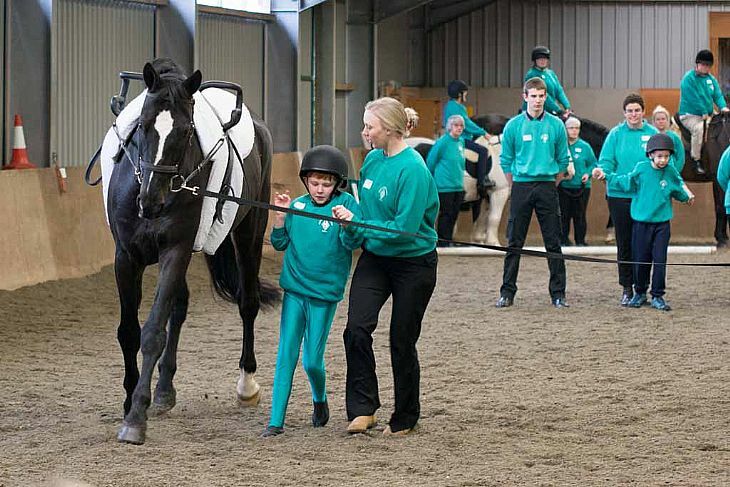 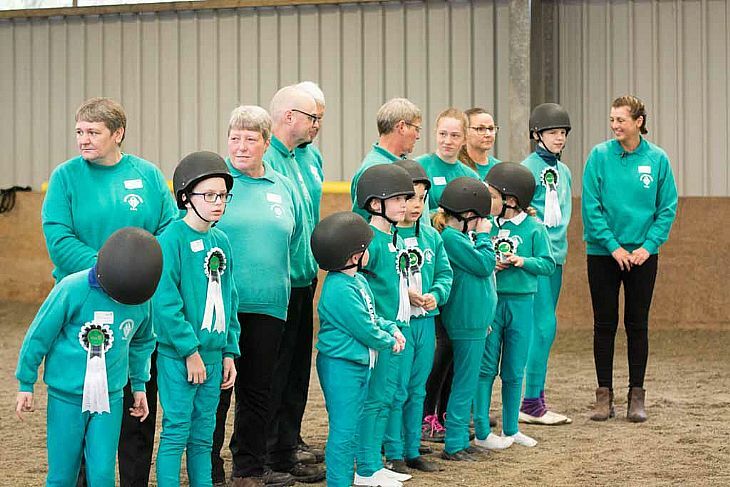 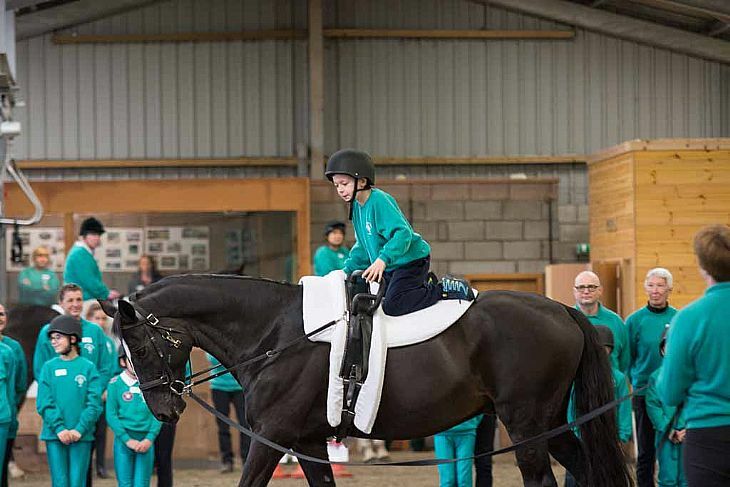 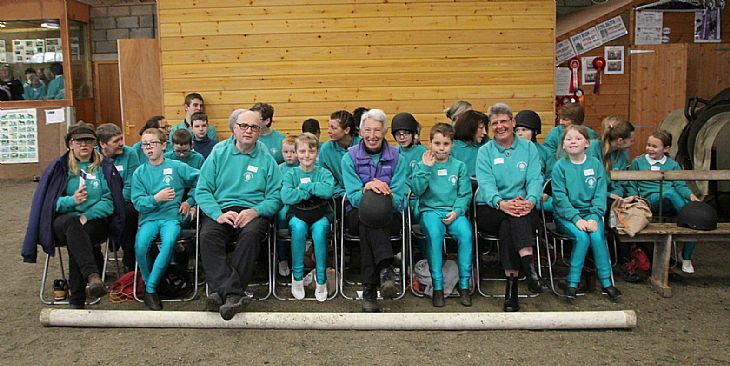 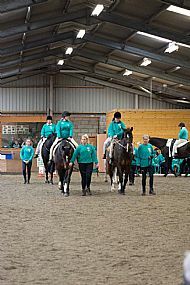 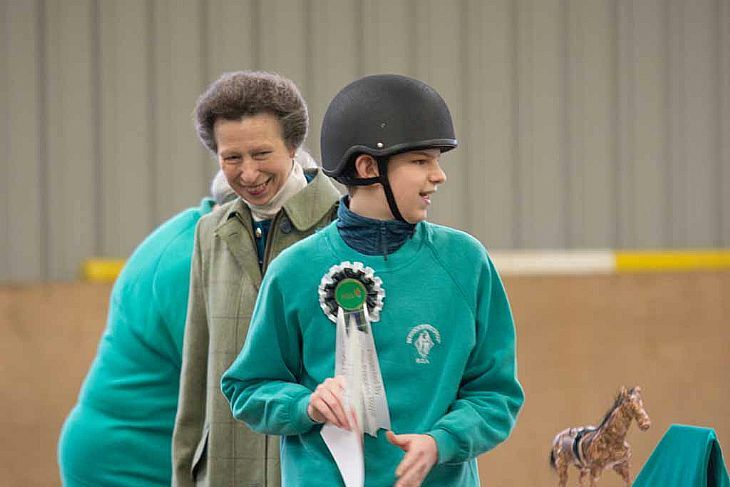 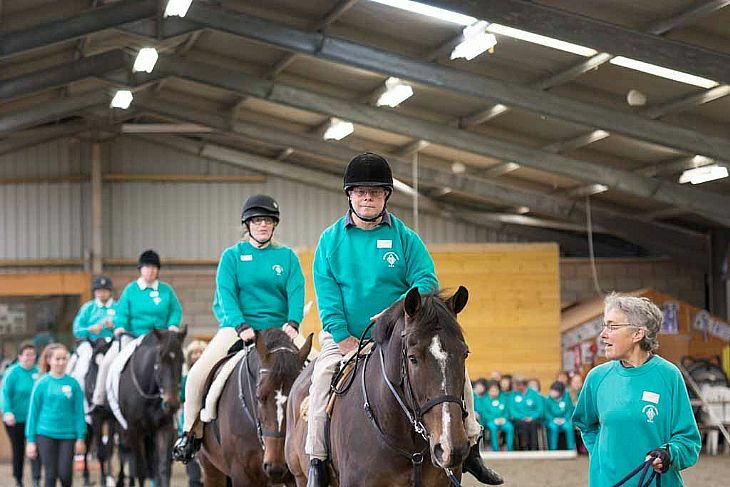 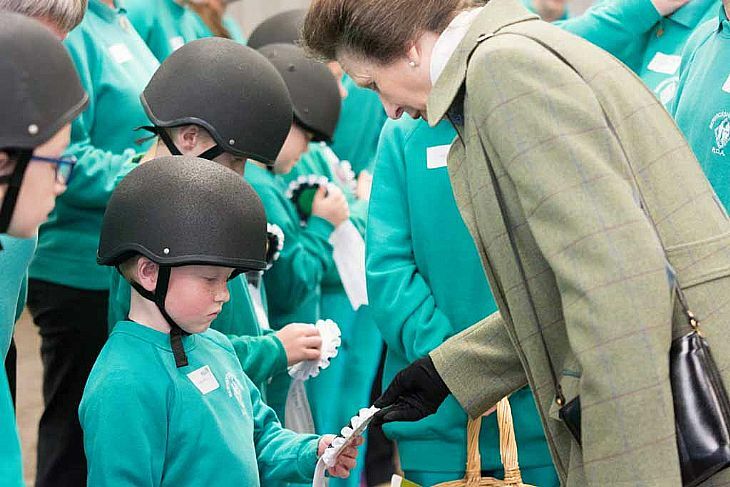 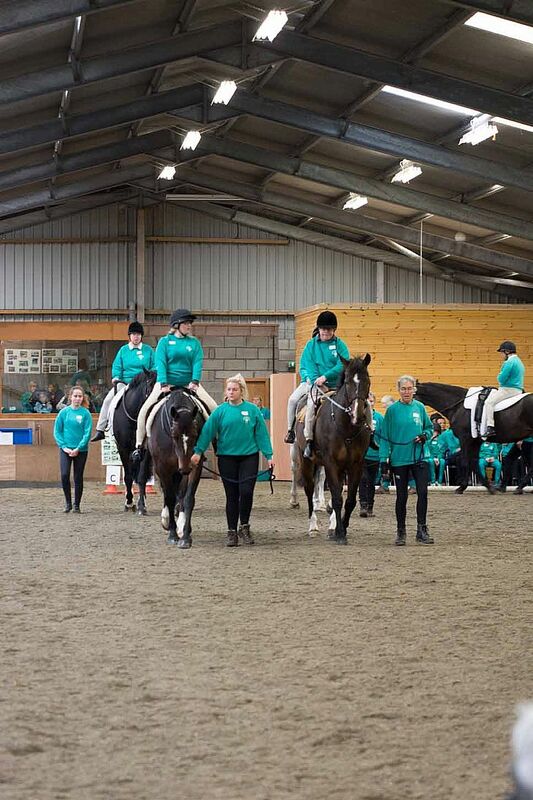 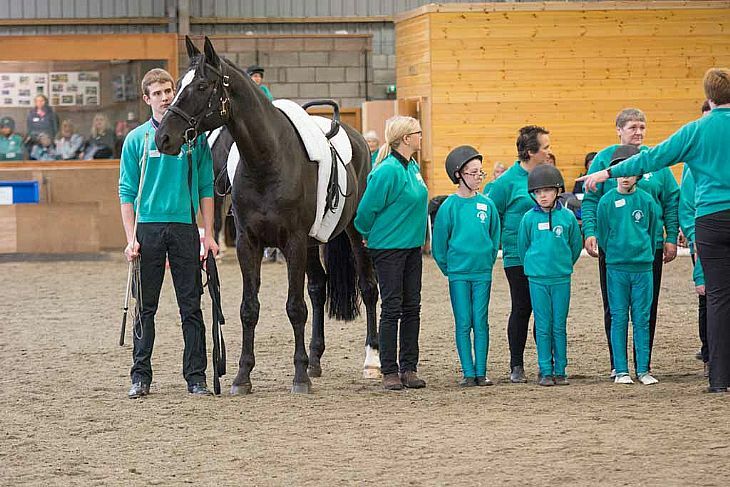 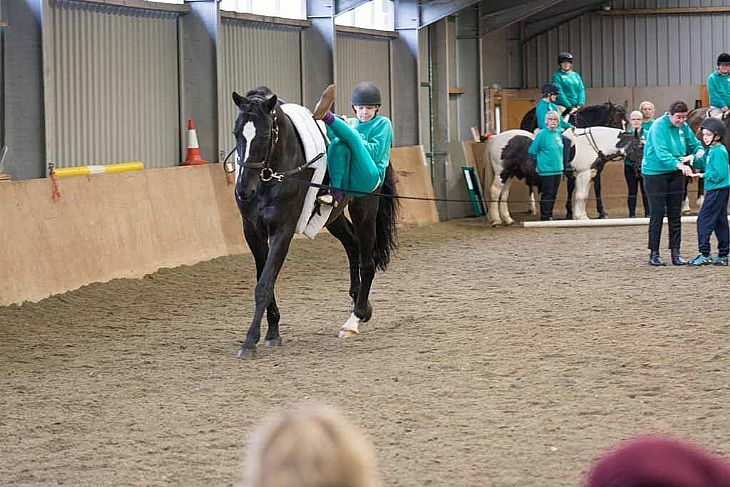 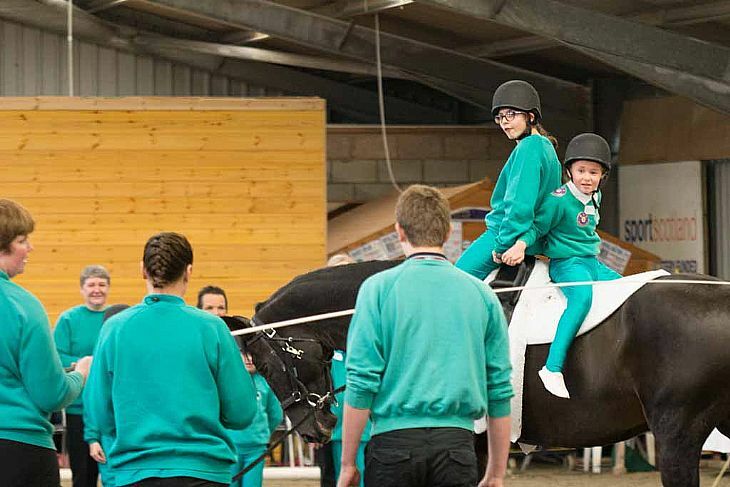 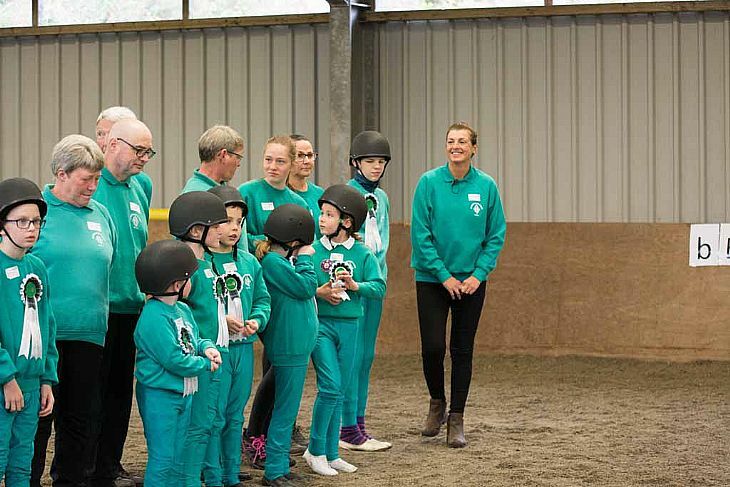 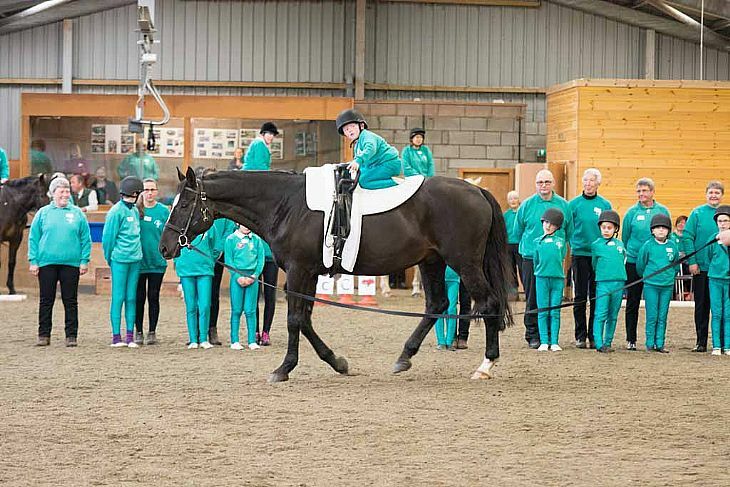 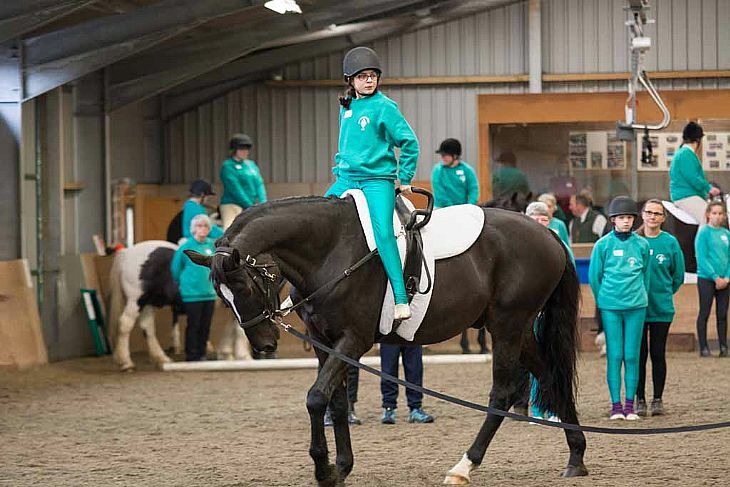 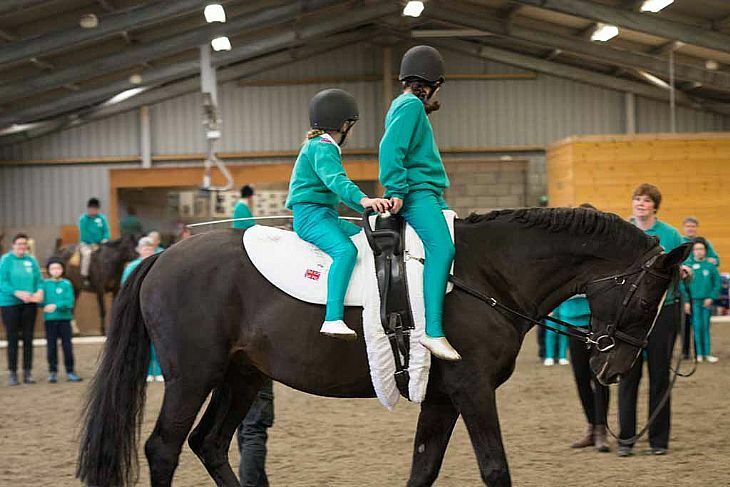 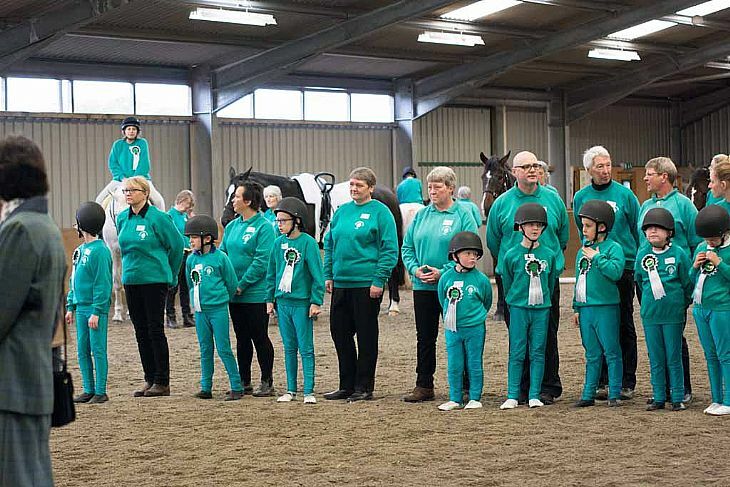 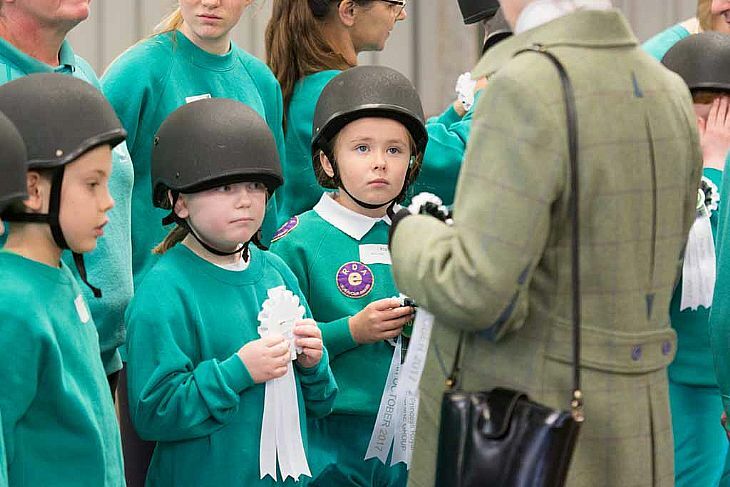 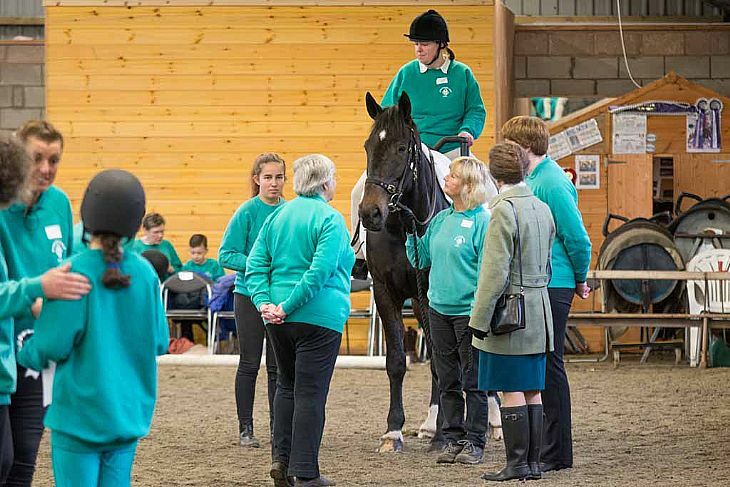 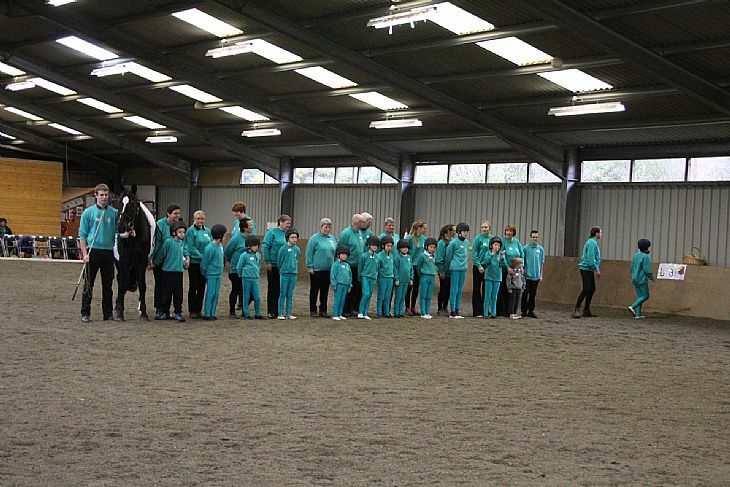 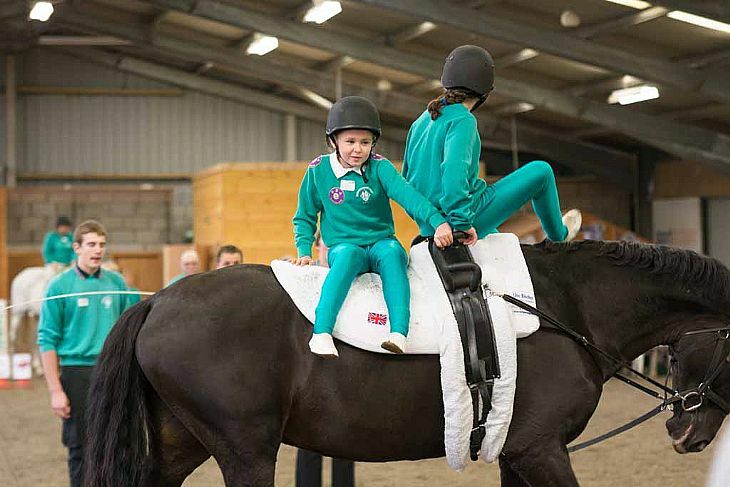 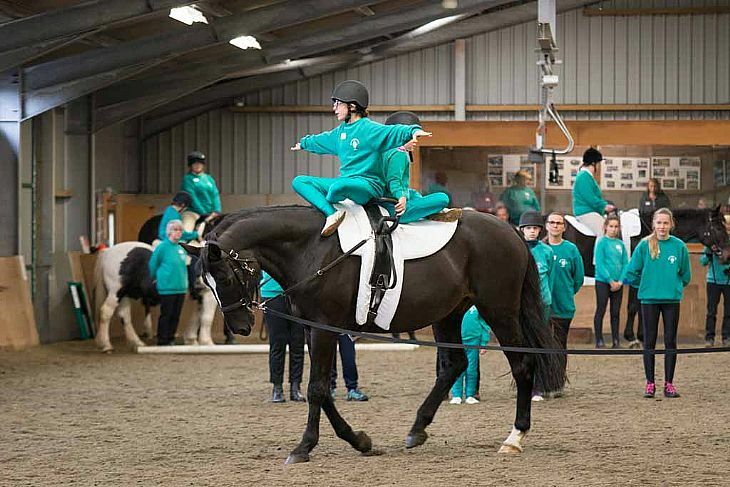 Group riders and vaulters assisted by Group helpers then performed a musical ride and vaulting exhibition for the assembled audience, before lining up to receive rosettes to mark the occasion, presented by HRH The Princess Royal, ably assisted by Emily Judd. 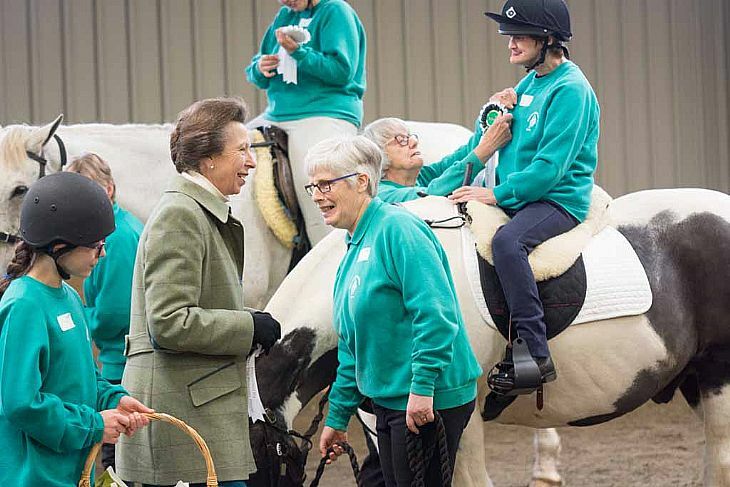 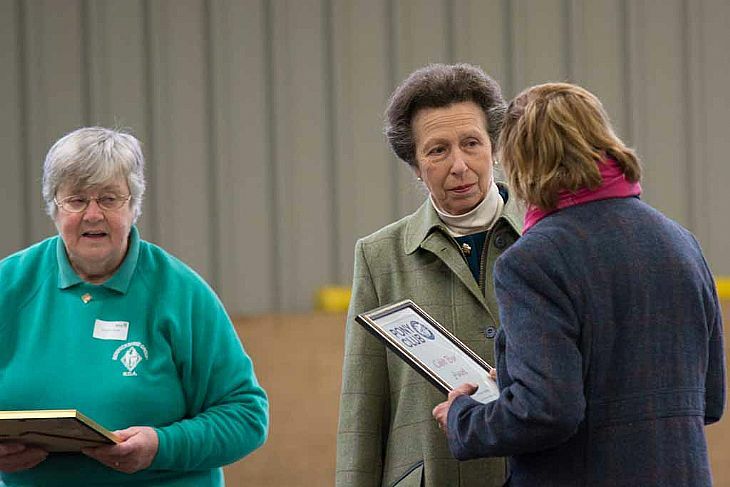 HRH The Princess Royal presented long service awards to Group volunteers Jude Logan; Sandra Grigg; Susan Patterson and Claudia Nisbet and an ASDAN certificate to Harry McCann. 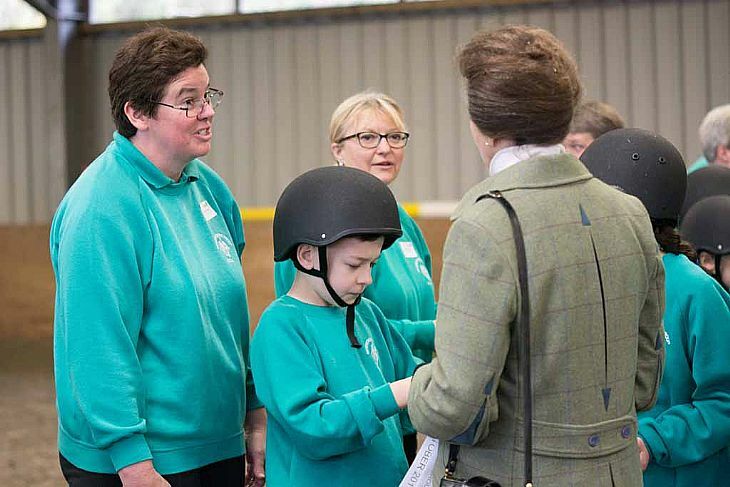 Awards were also presented to Doreen Calder (Pony Club Cubbit Award, 40 years), to Jean Clarkson of Machars RDA (RDA President’s Award) and a cheque was presented to Sam Orde (RDA Chairman) being the proceeds from her ‘Big Vault’ at the Group. 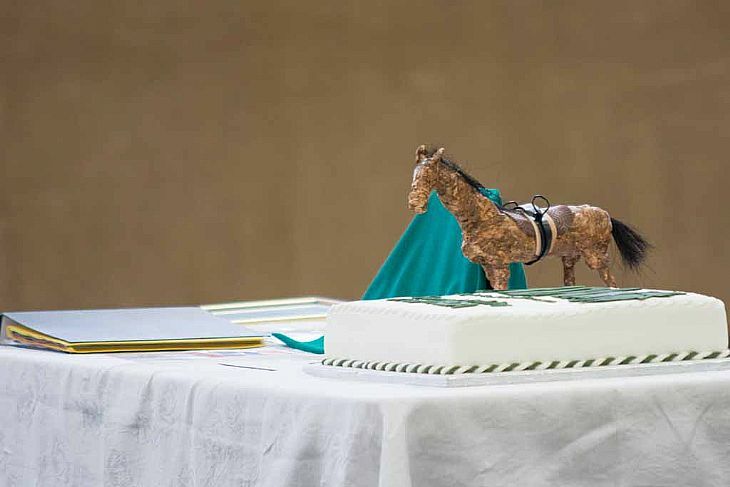 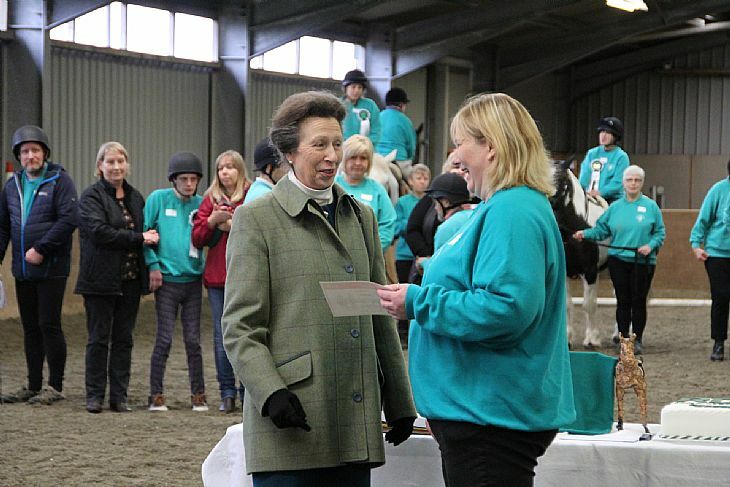 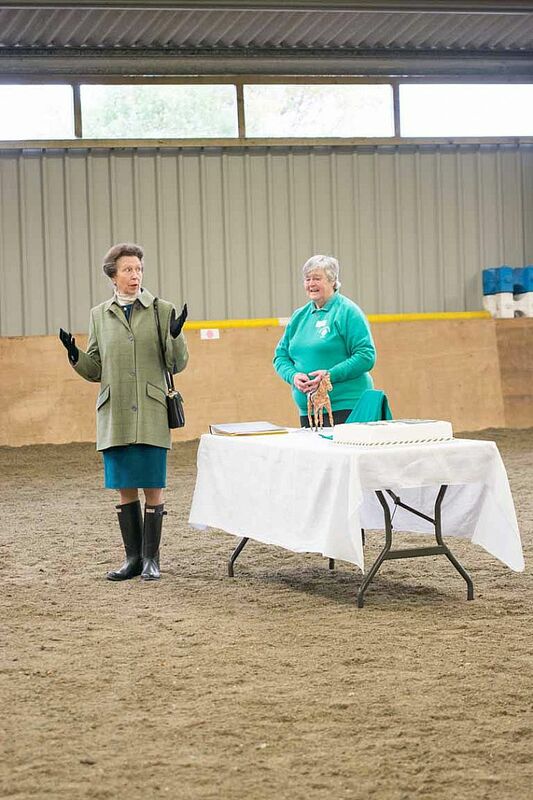 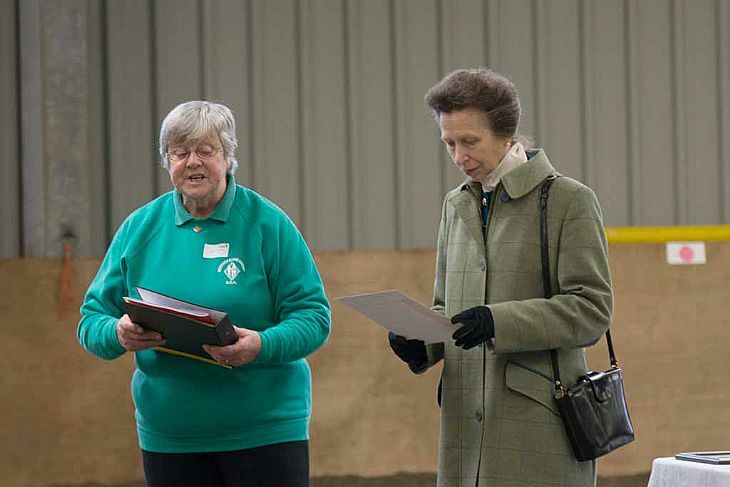 Margaret Morgan (Berwickshire Group RDA Chair) said a few words of thanks and invited HRH to unveil a commemorative plaque for Sandy’s Stable and to cut the cake, after which HRH spoke to the audience commending the efforts of the Group in its work and in the purchase of Sandy the mechanical horse and thanking everyone for their help and support. 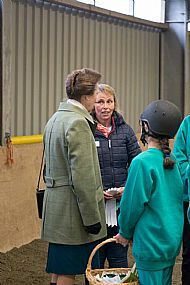 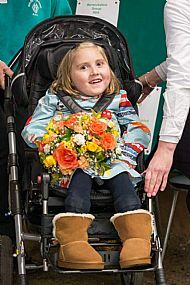 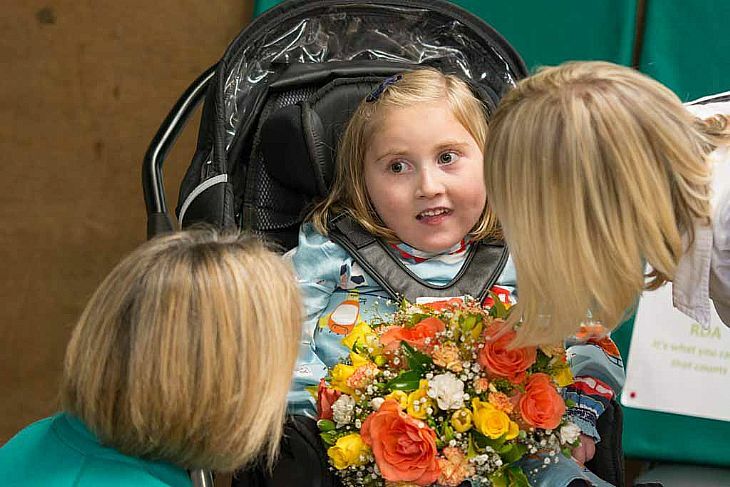 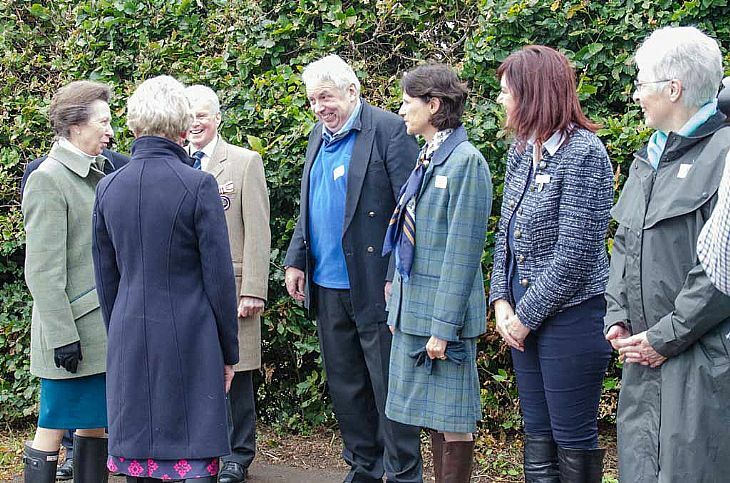 After speaking to assembled groups of supporters and trustees, HRH The Princess Royal was presented with a posy by Eve McGonigal before leaving. 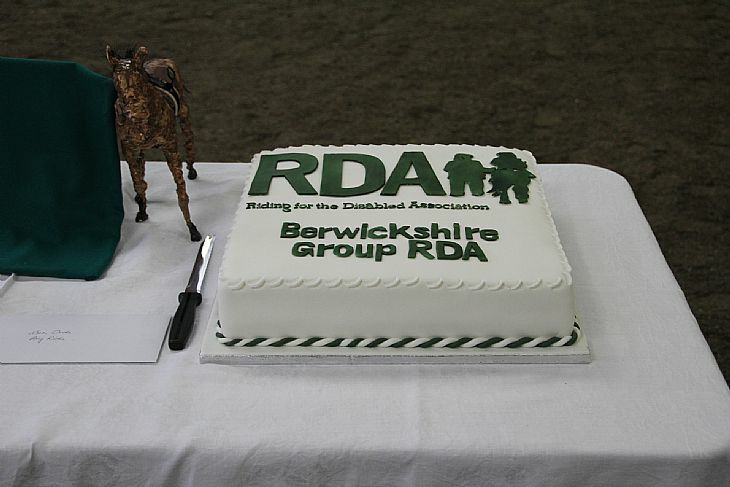 Guests enjoyed a superb spread provided by Rhona Darling at the end of a very successful visit. 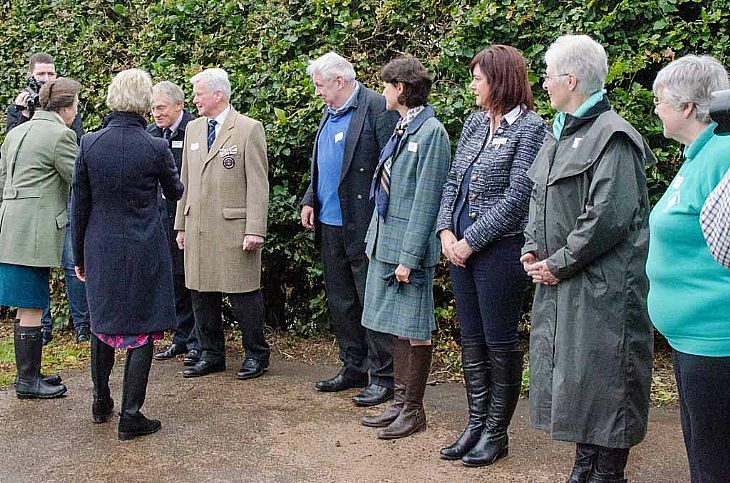 Our Group is also indebted to to William Gillie and Frank Wood, who were the official photographers on the day. 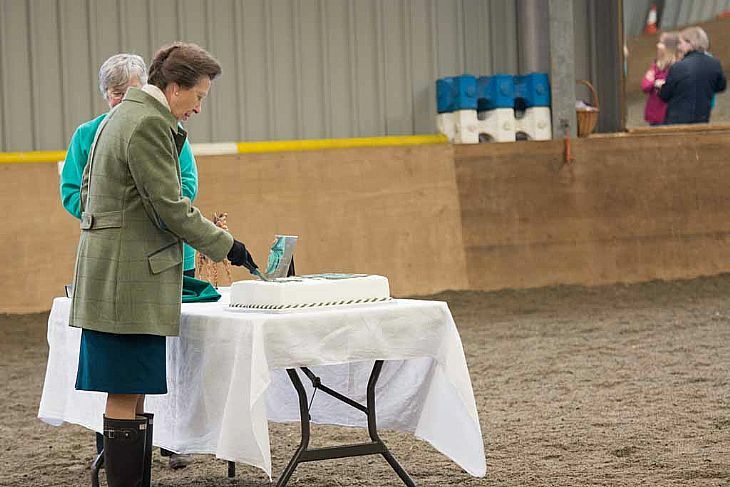 Between them they took over 430 photographs! 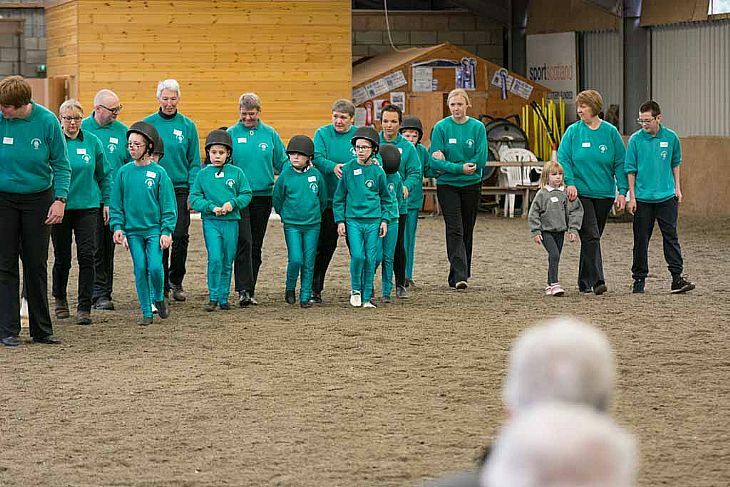 With such a number taken, the ones displayed below are only a selection of those taken. 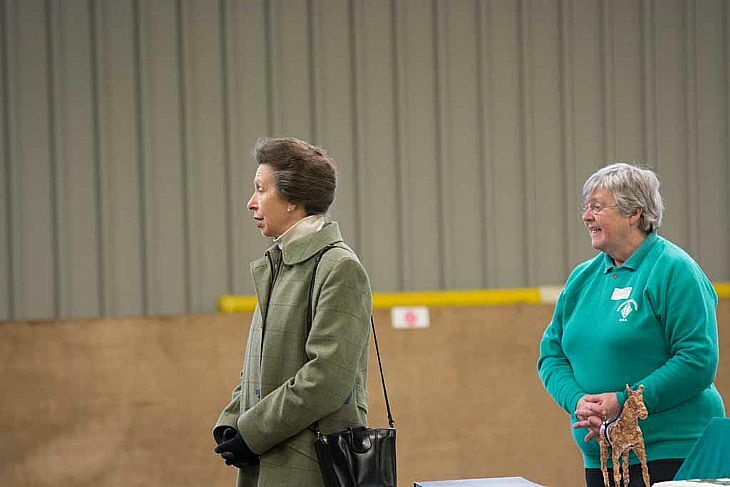 Thanks to William and Frank, there is no copyright on any of these photos. 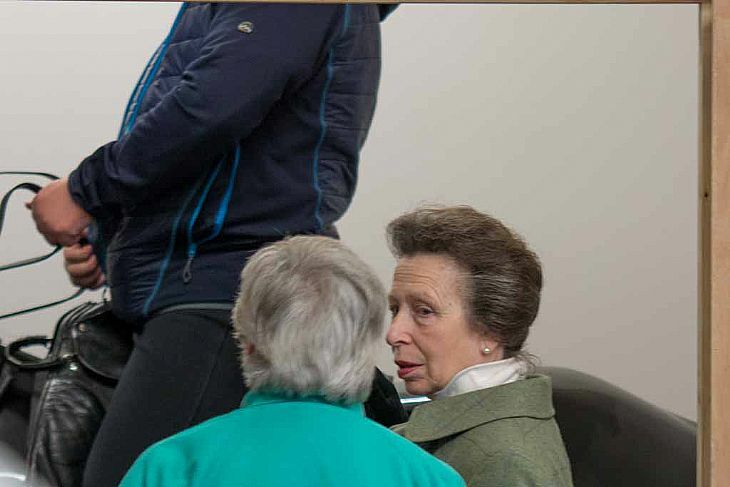 To take a copy, simply double click on the photograph you like and then right click and save to your computer. 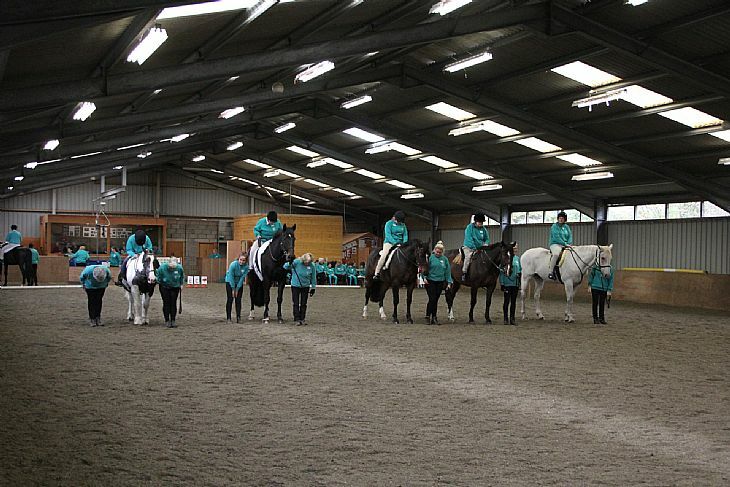 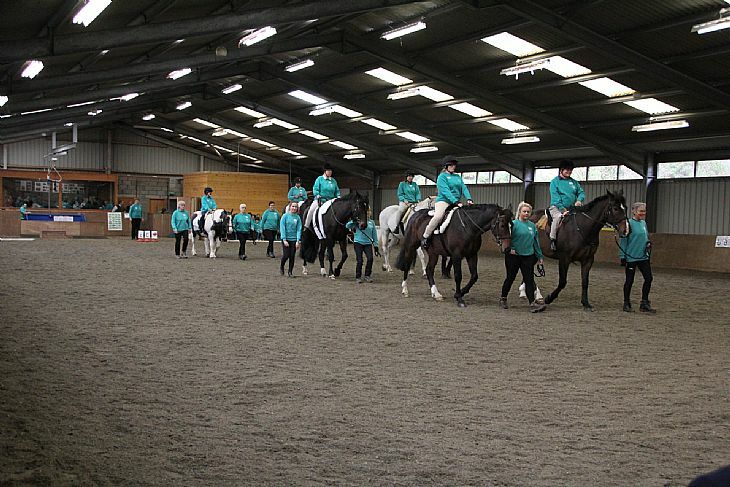 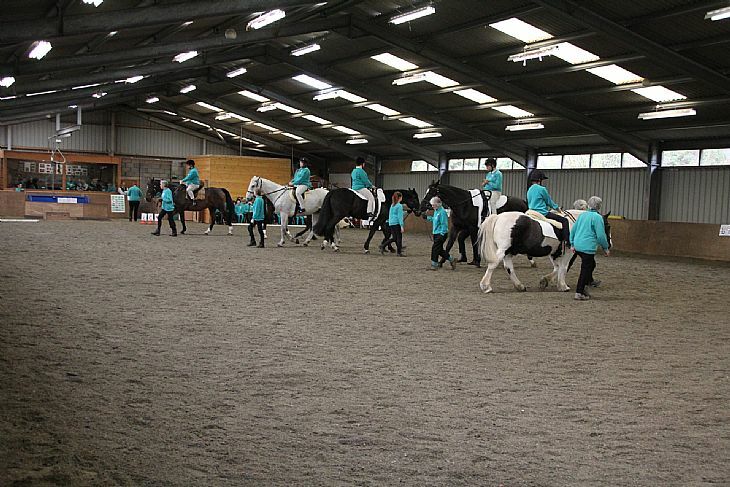 Other photographs taken on the day can be viewed on a laptop at the riding school.